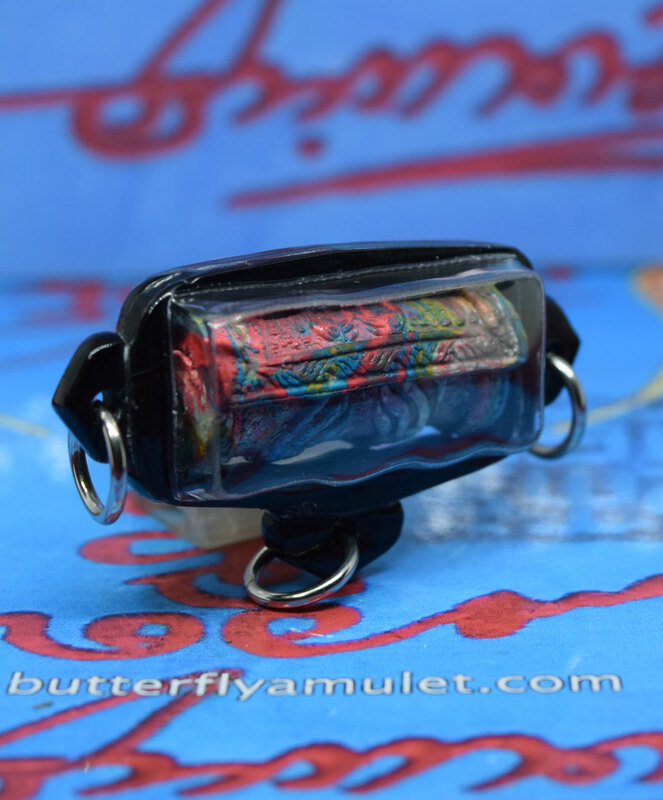 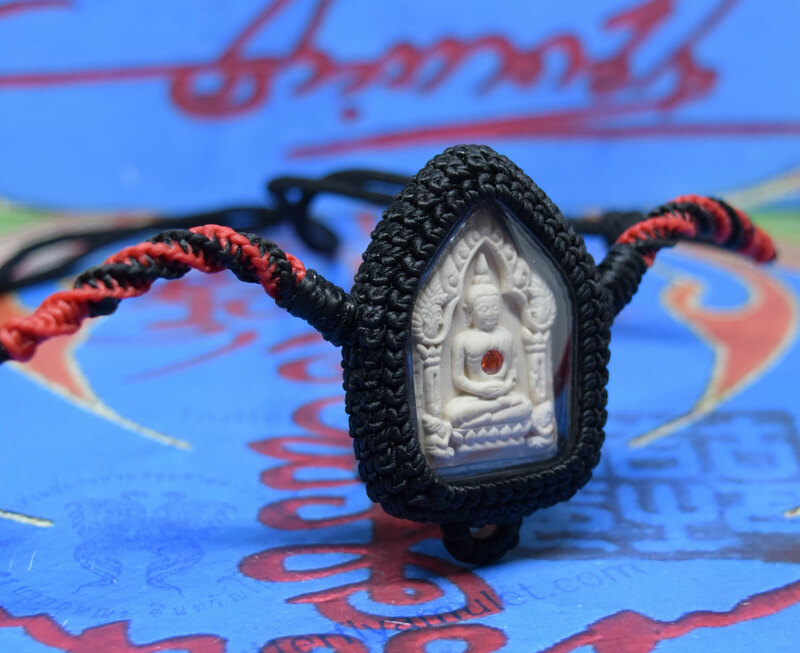 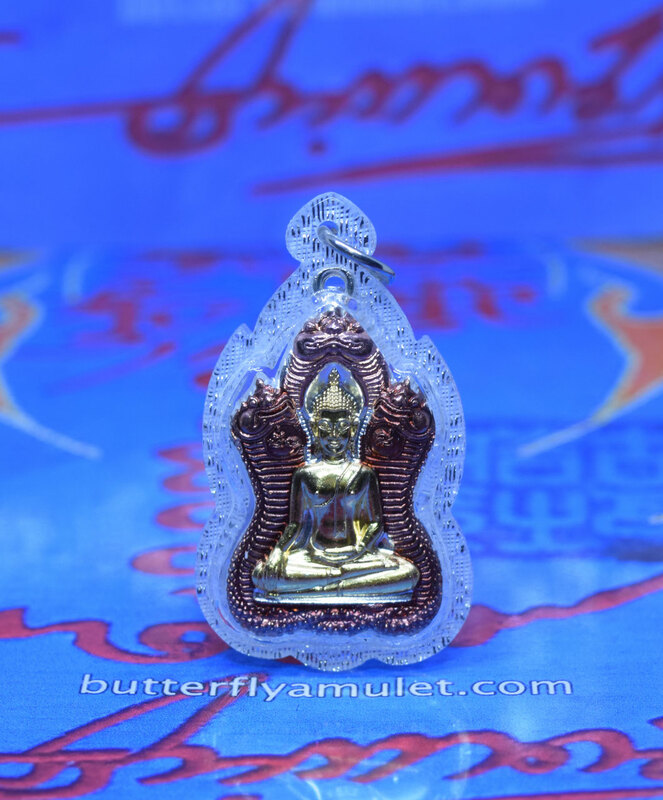 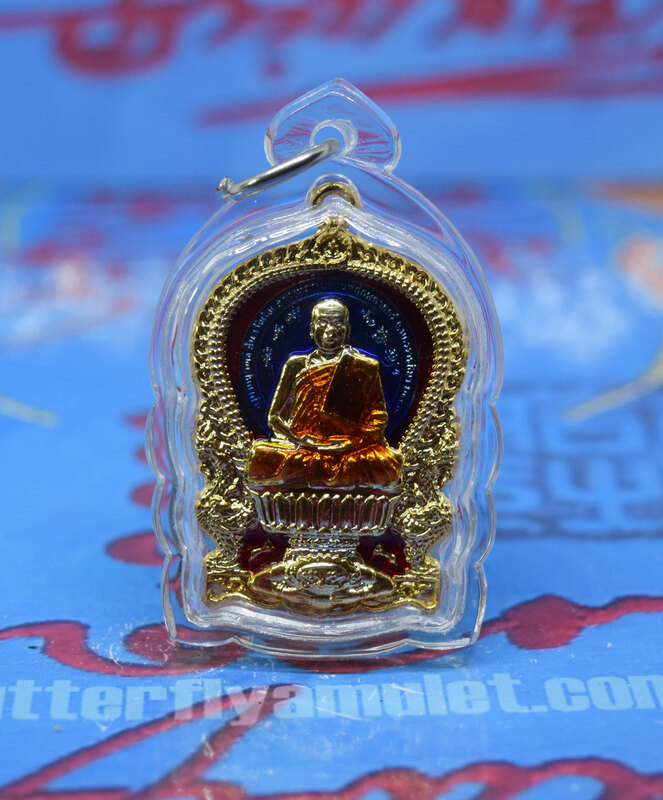 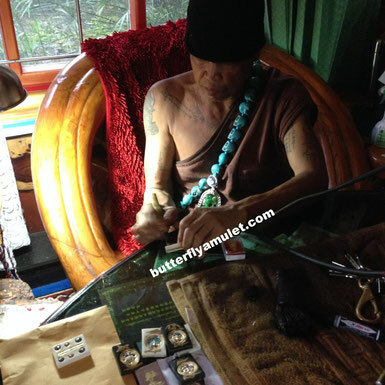 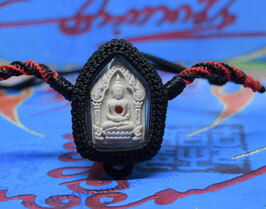 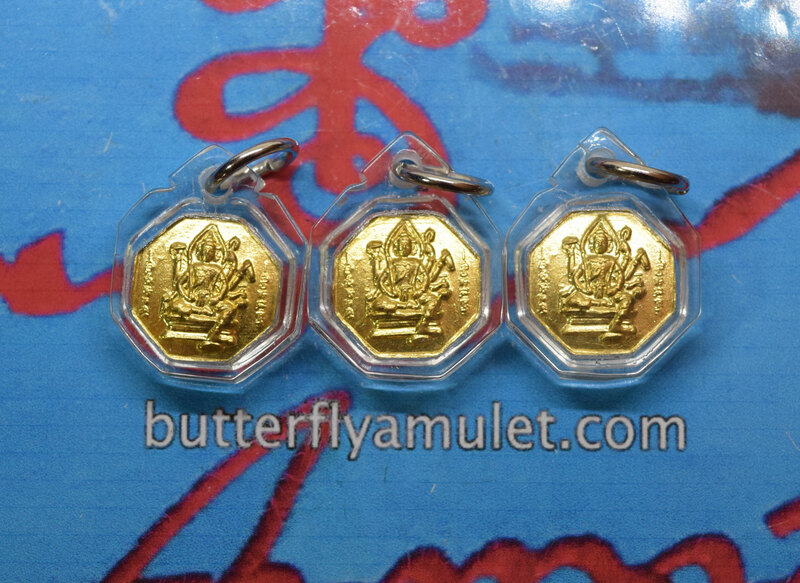 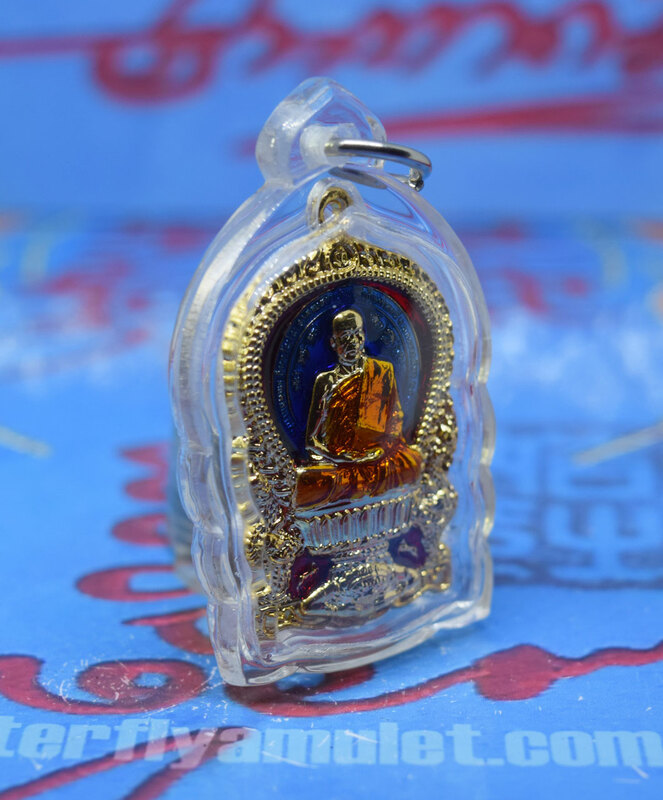 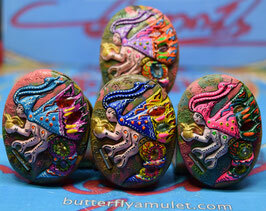 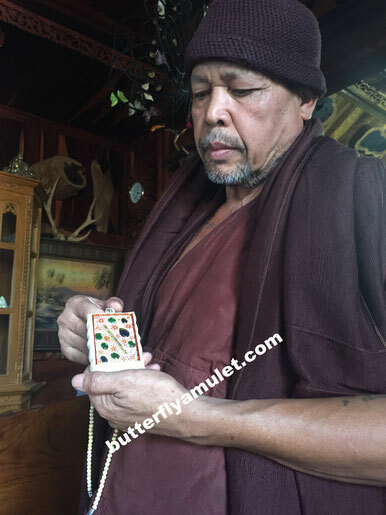 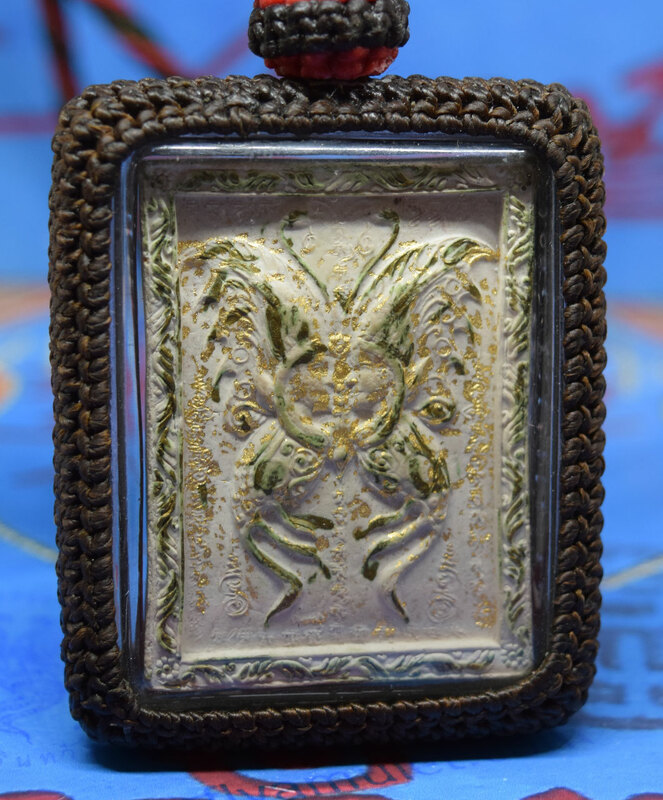 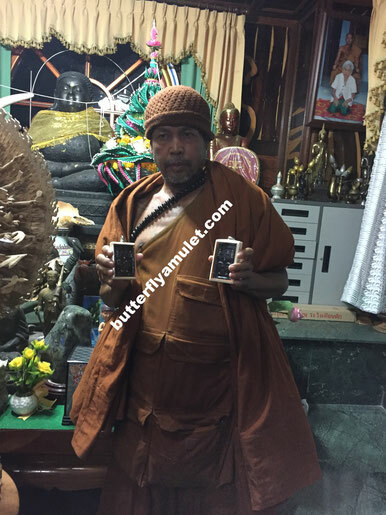 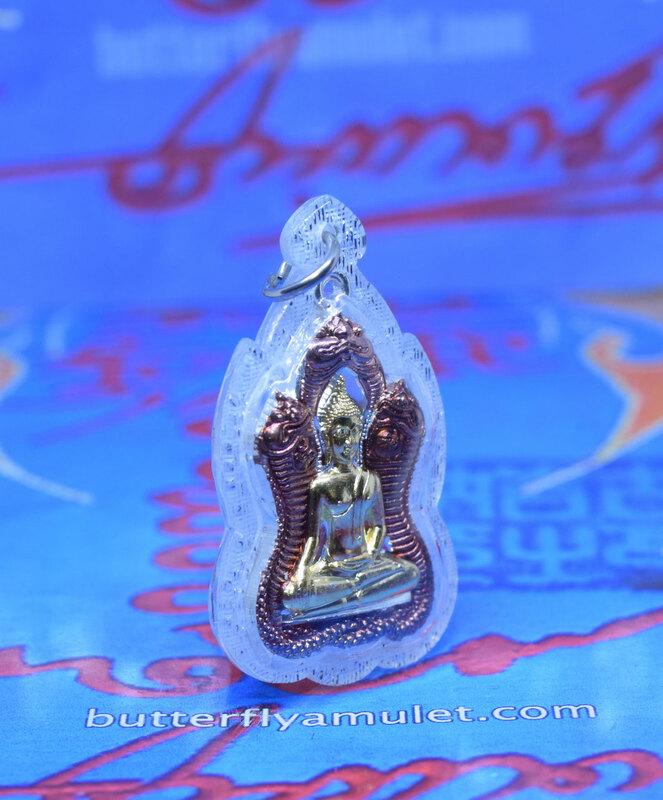 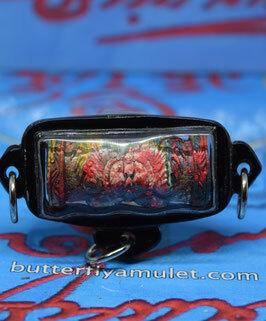 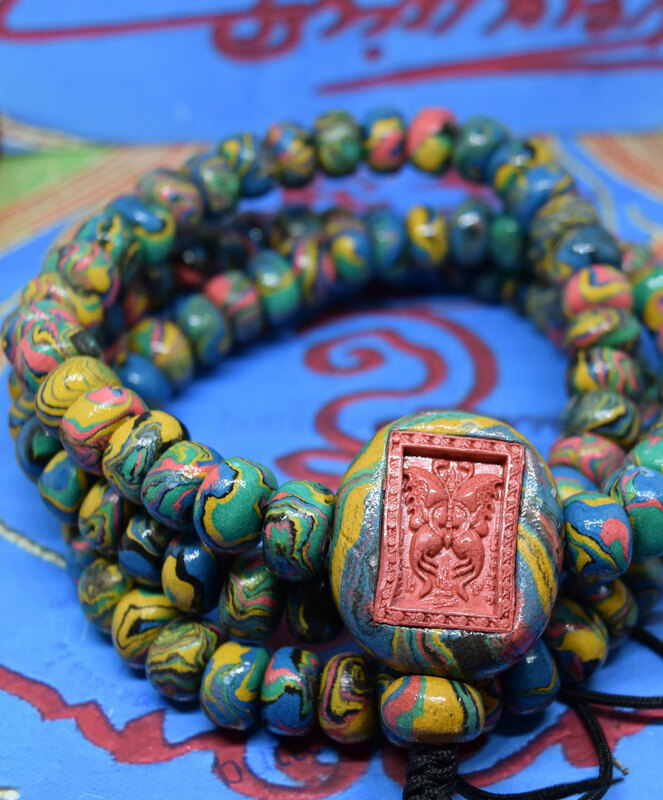 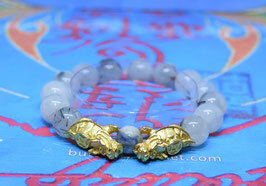 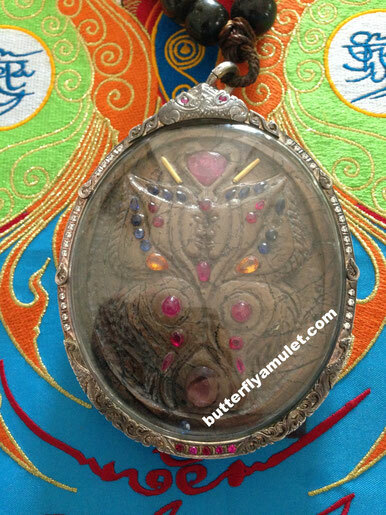 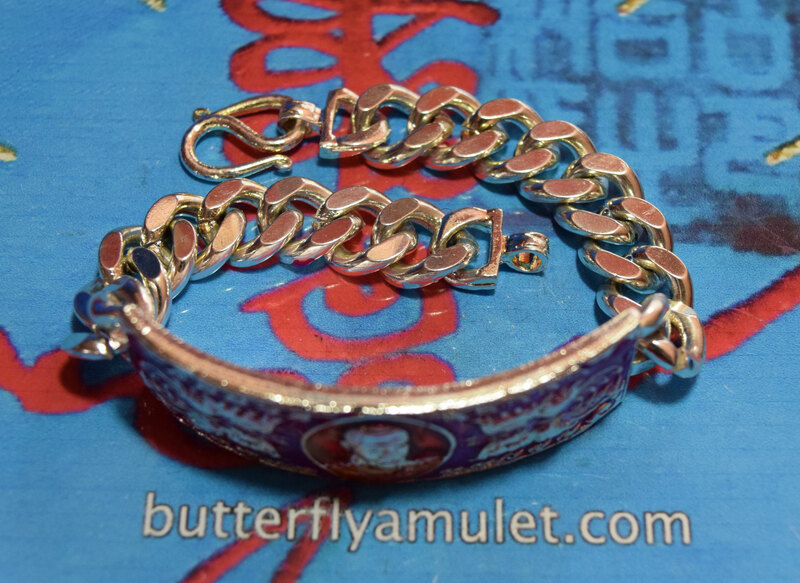 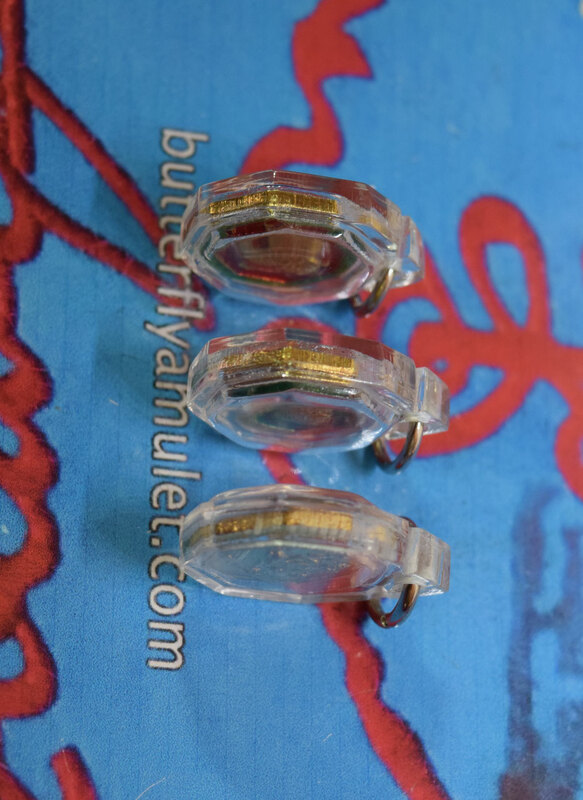 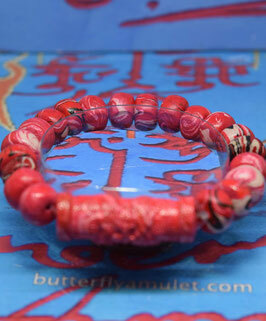 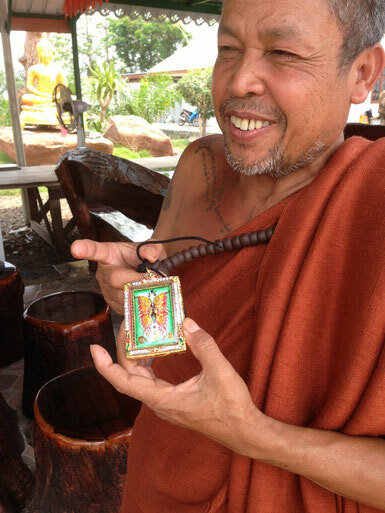 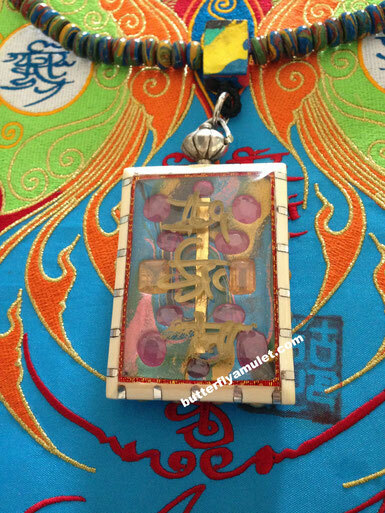 Mini Butterfly Medallions with Phra Phrom in a Hexagon shape waterproof casing. 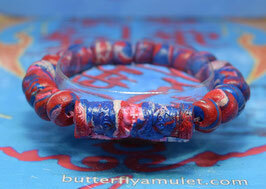 Available in three colours red , green and blue. 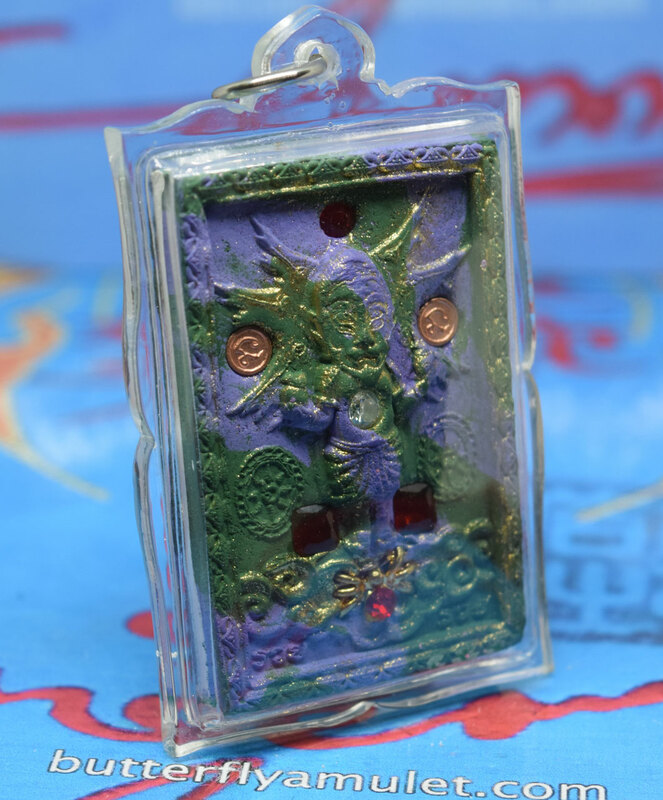 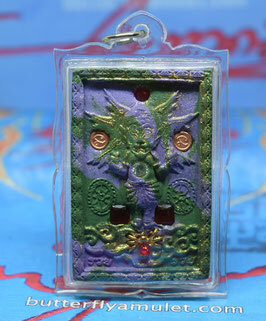 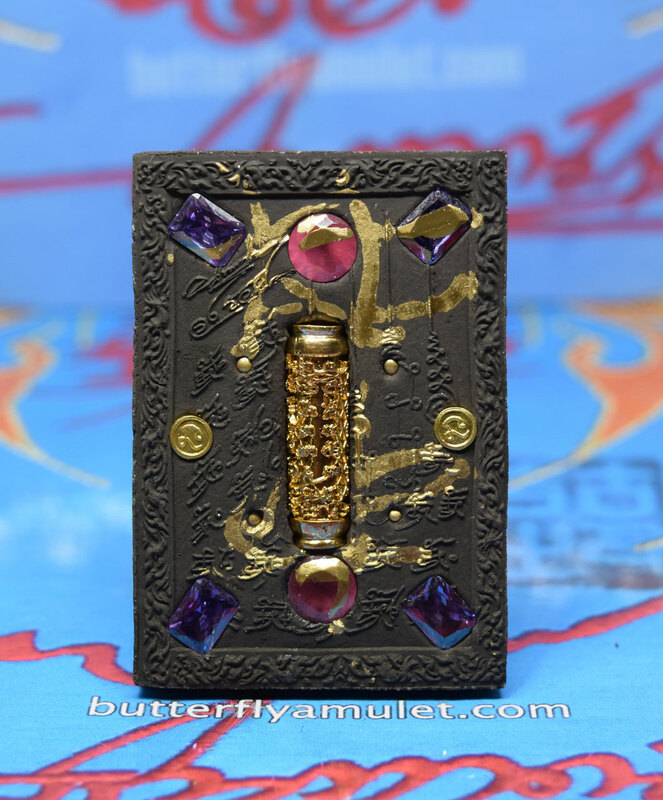 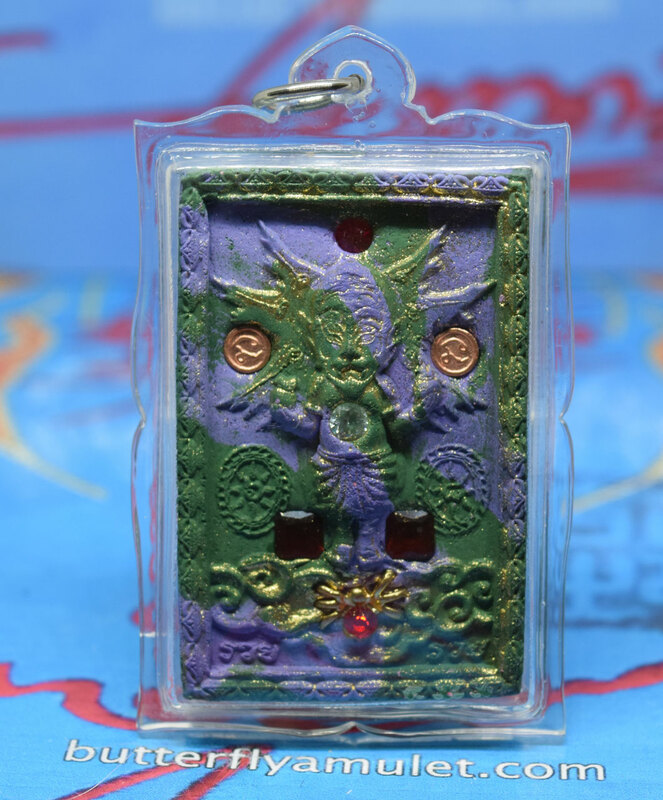 Amulet is approximately 64mm x 44mm made from a mixed colour (green&purple) powder in 2018, BE2561. 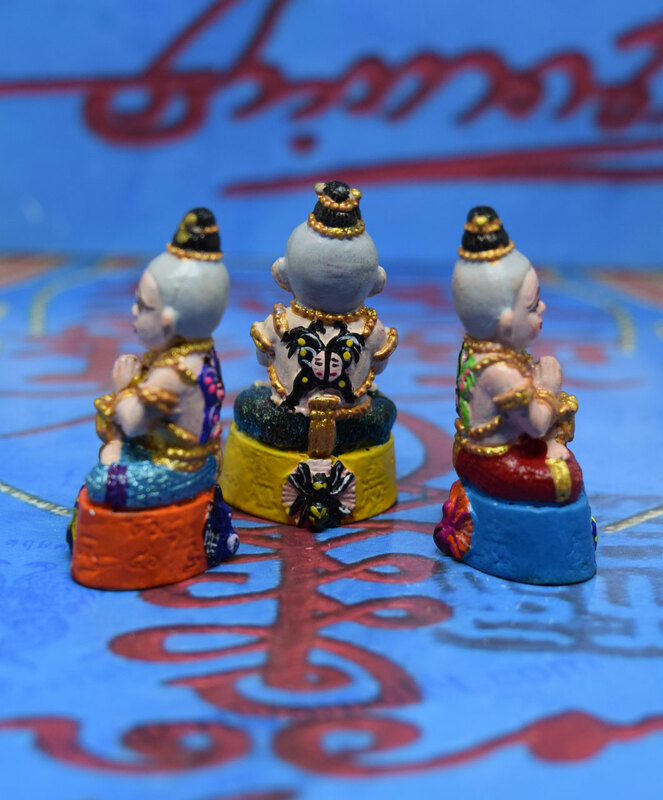 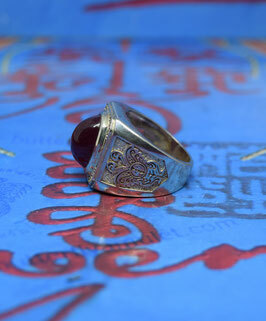 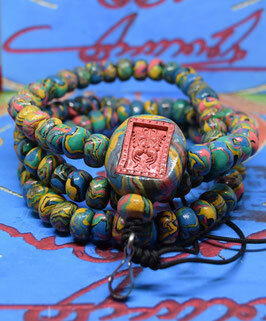 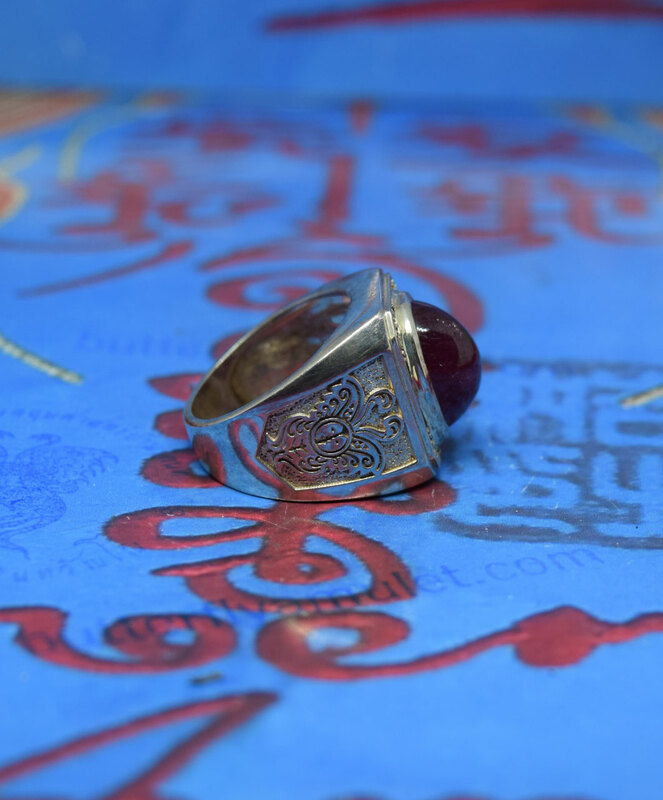 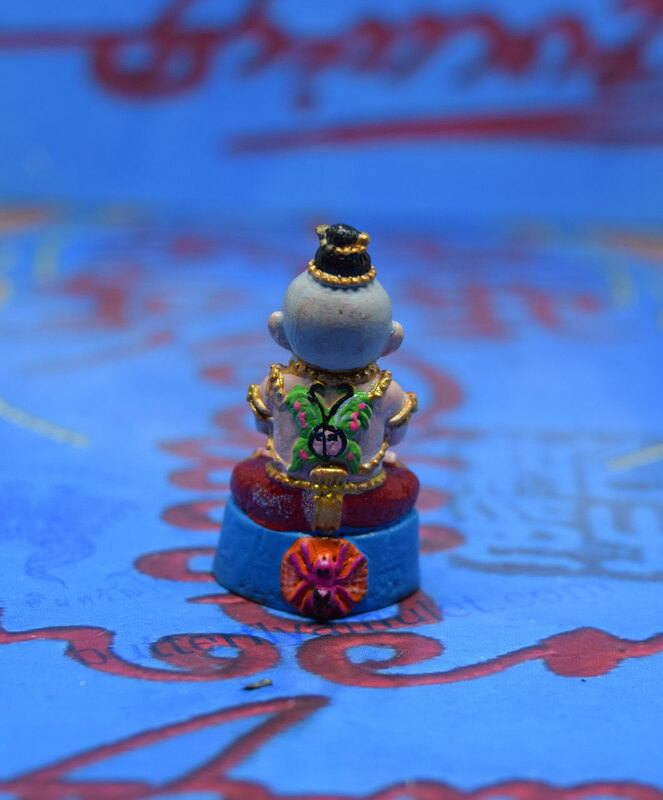 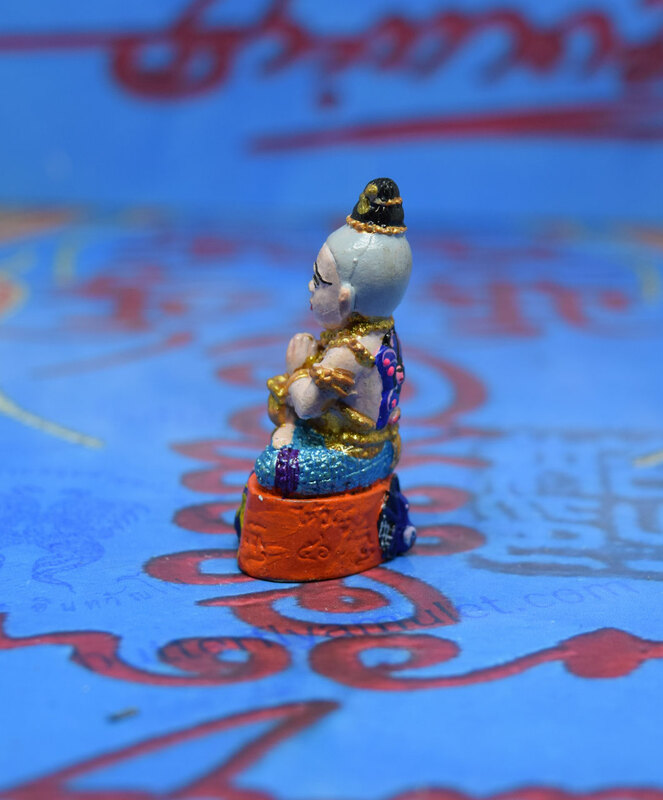 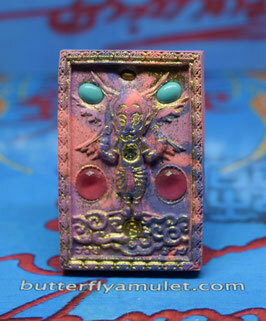 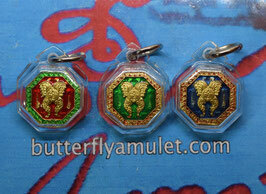 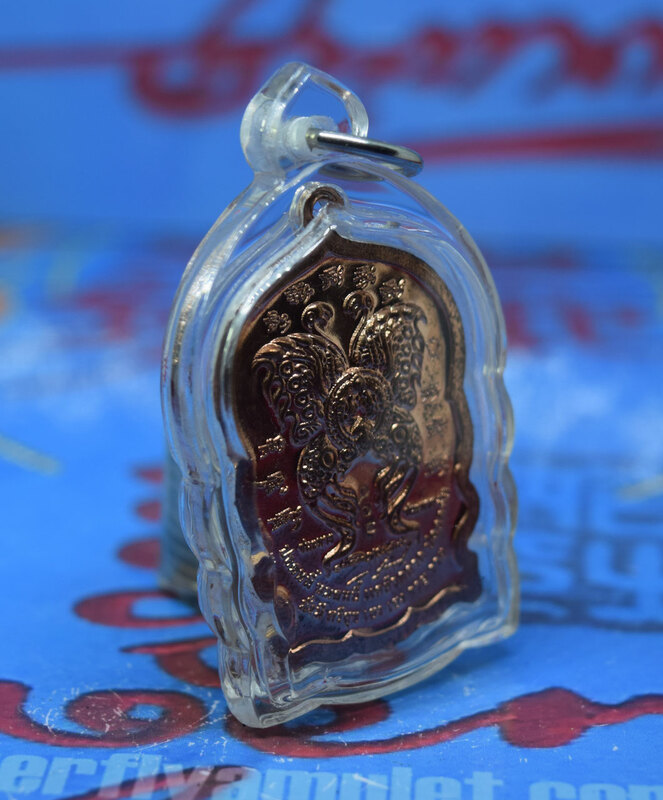 Four red gems , two temple seals set around the Si-Hoo-Ha-Tha , set in the reverse side a Ganesha with six red gems. 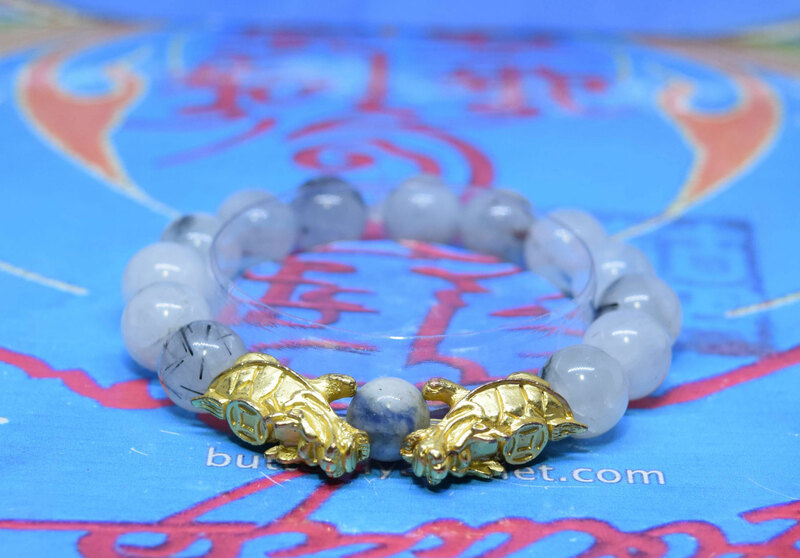 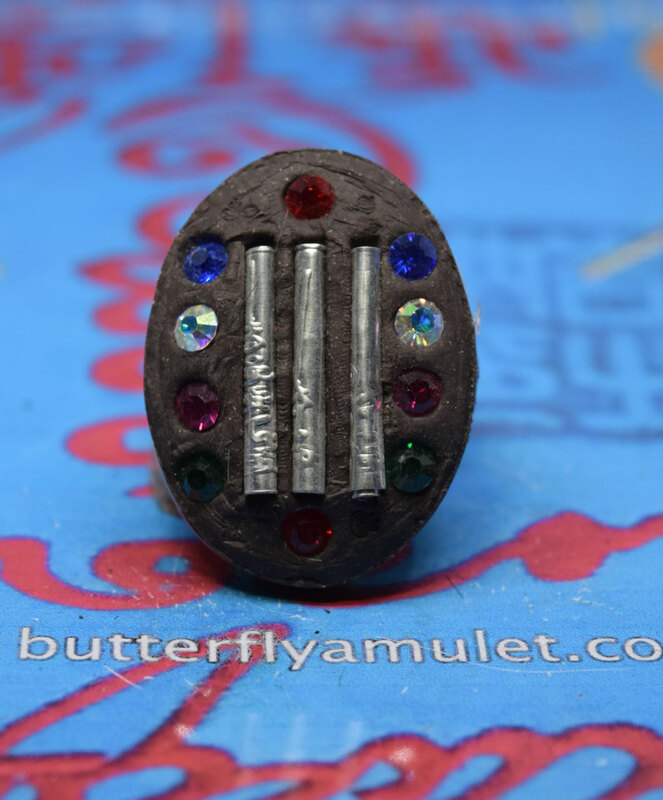 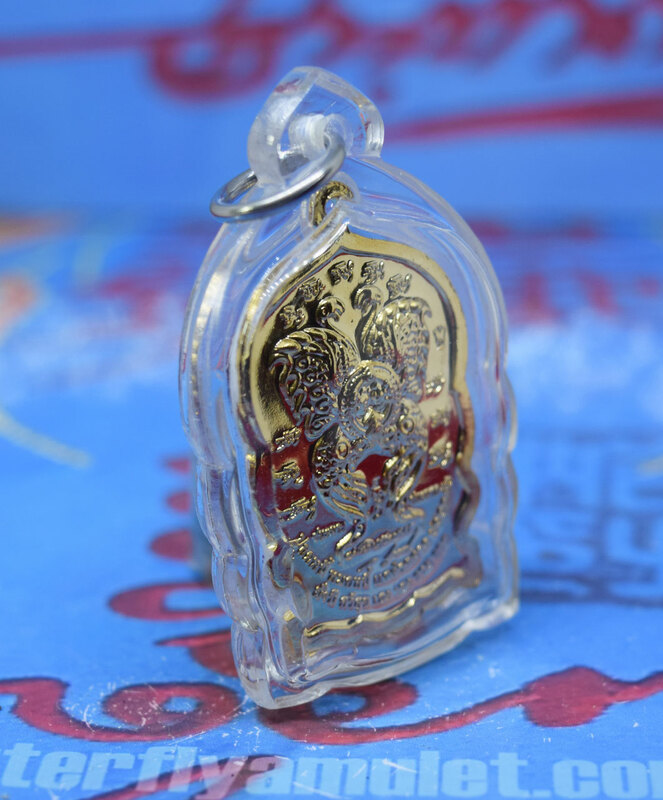 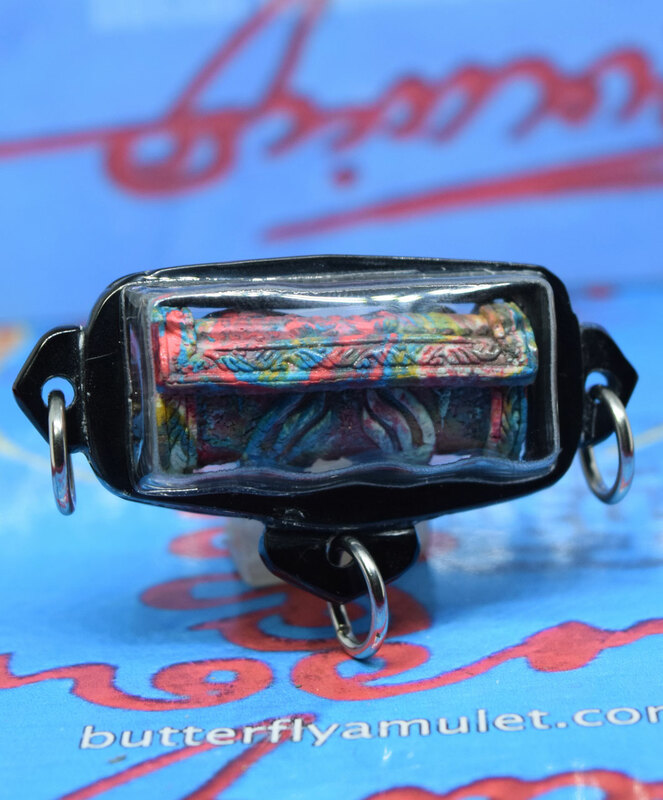 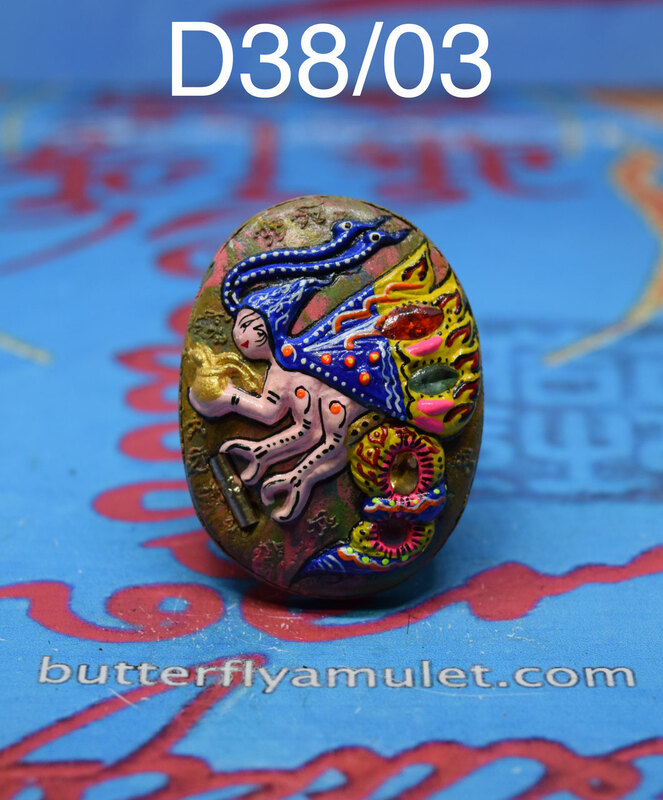 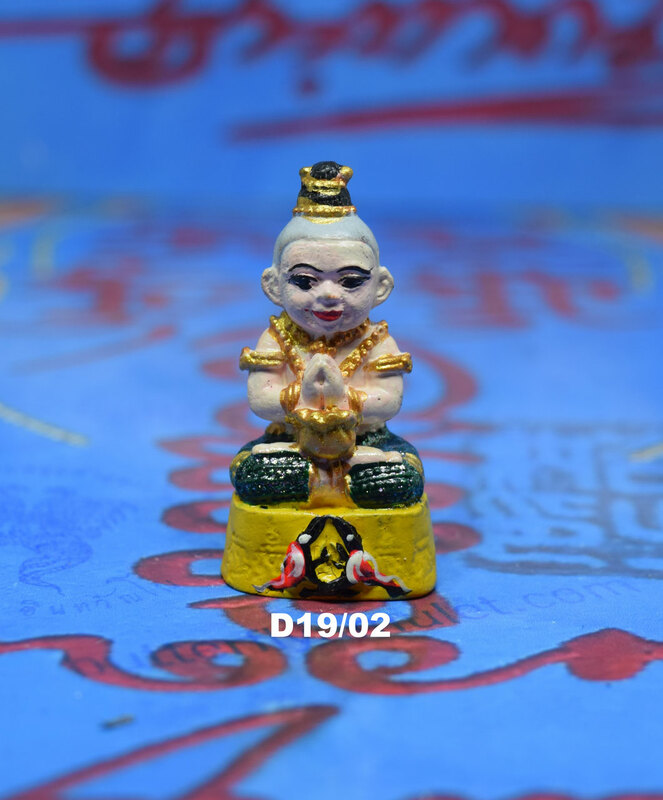 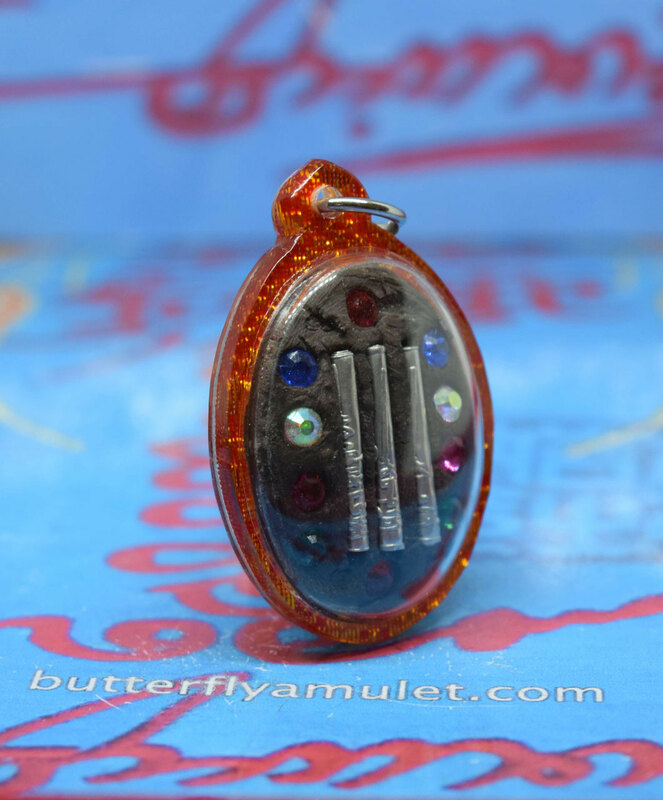 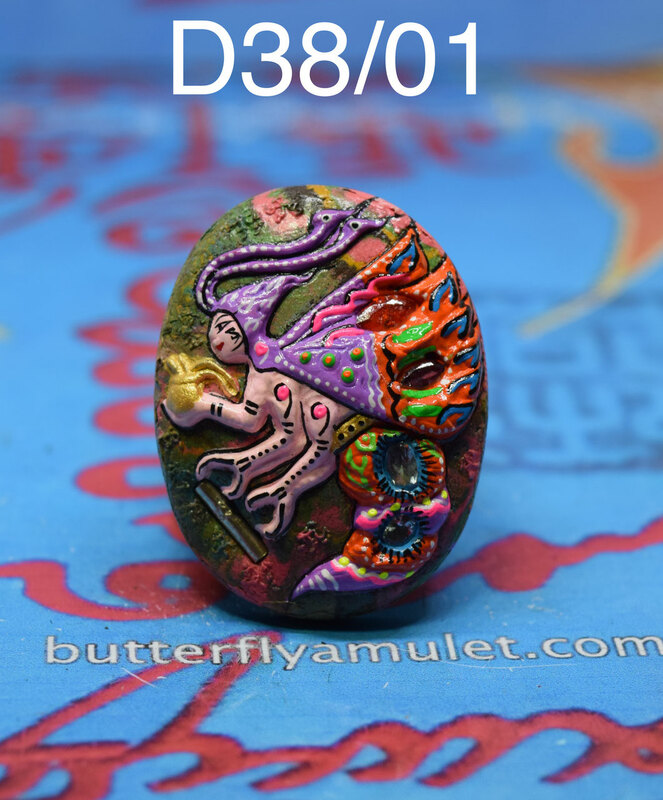 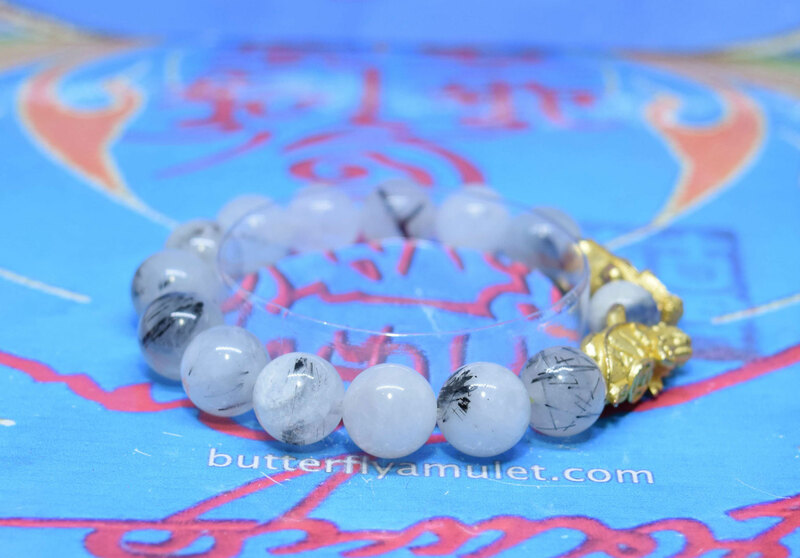 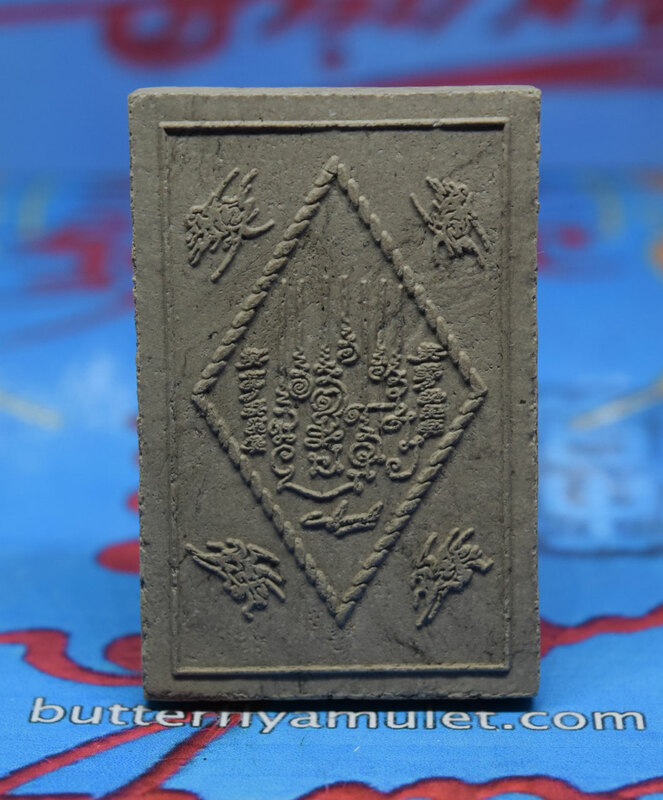 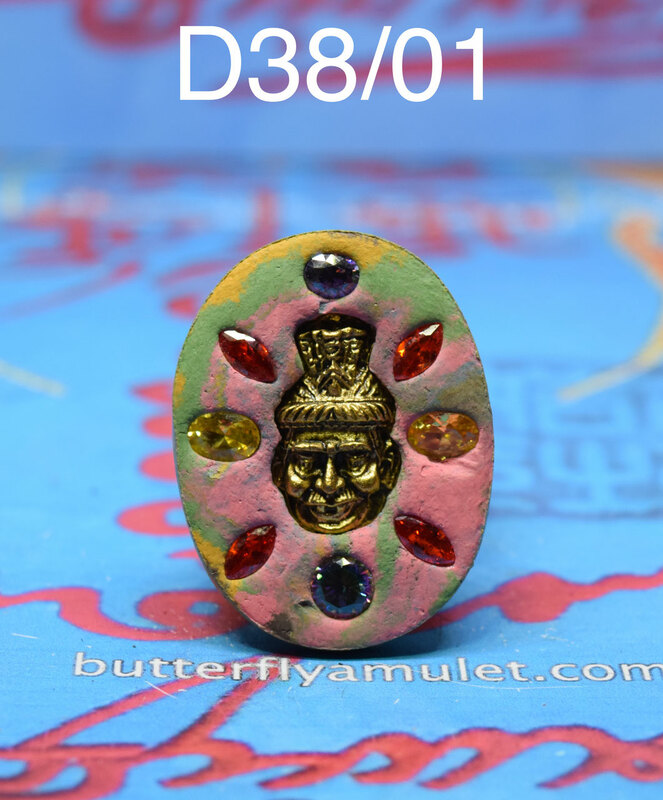 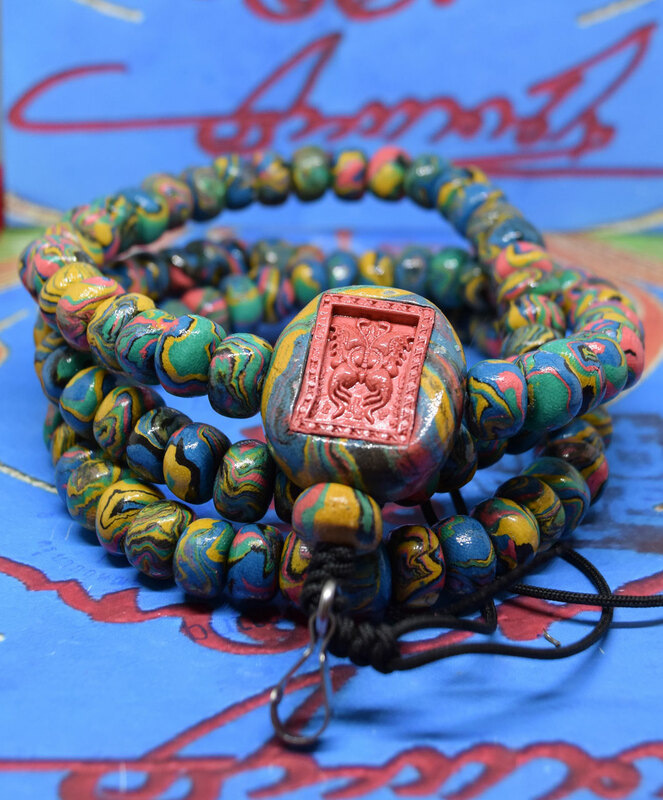 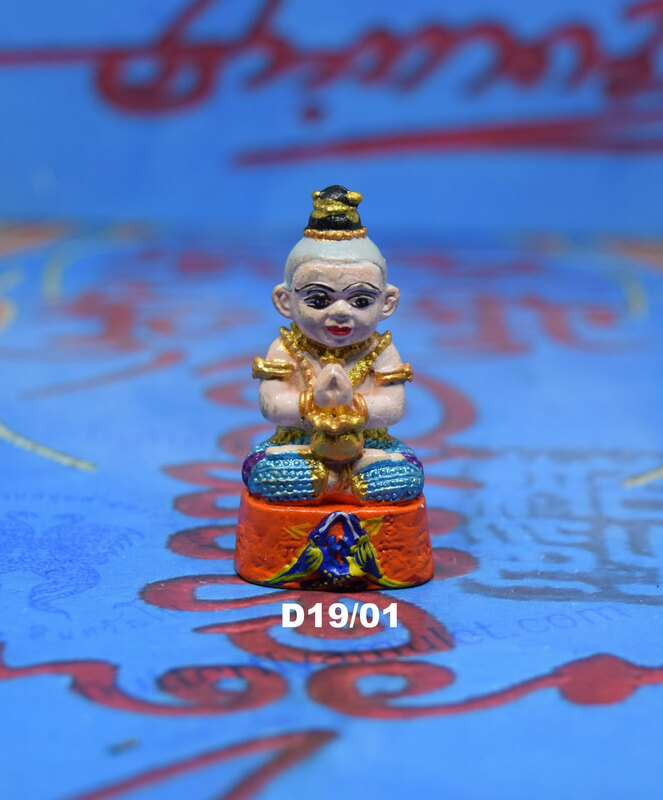 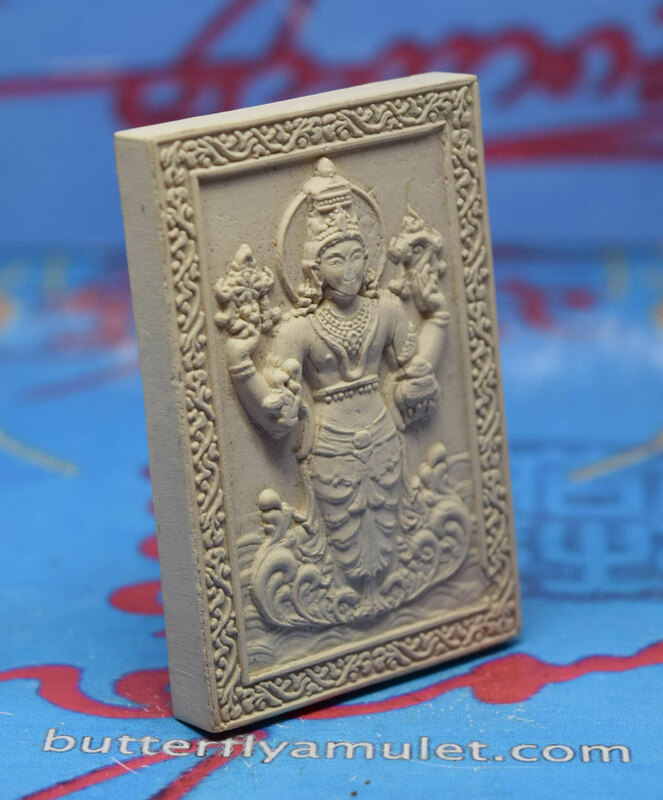 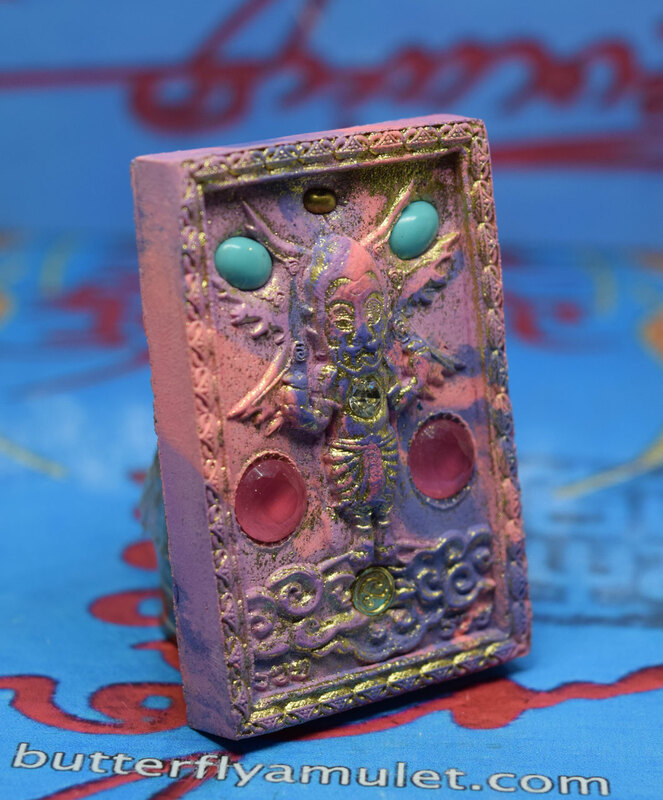 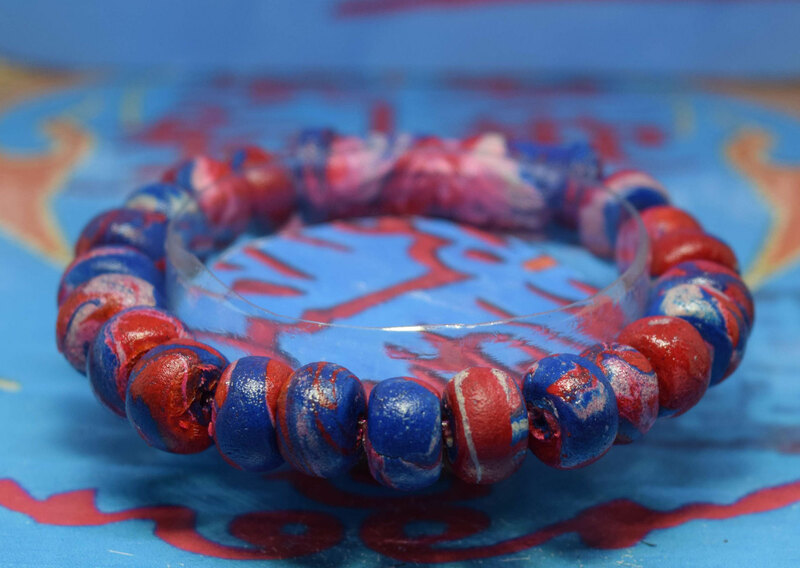 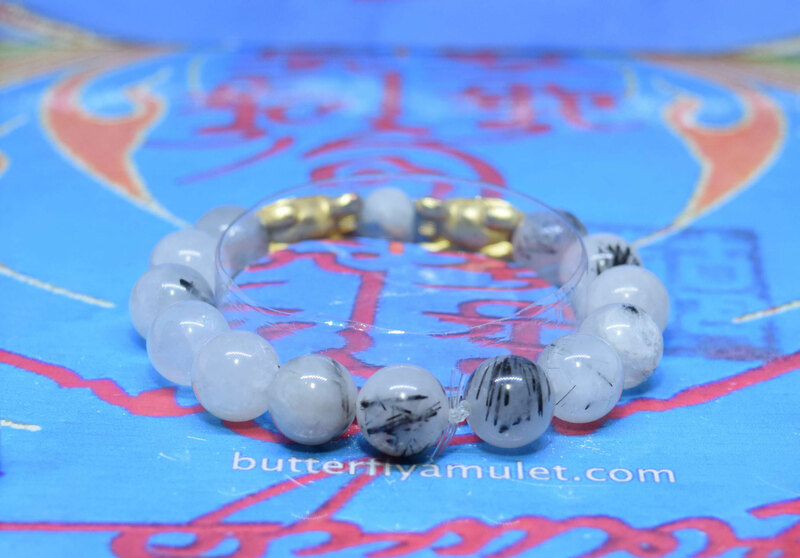 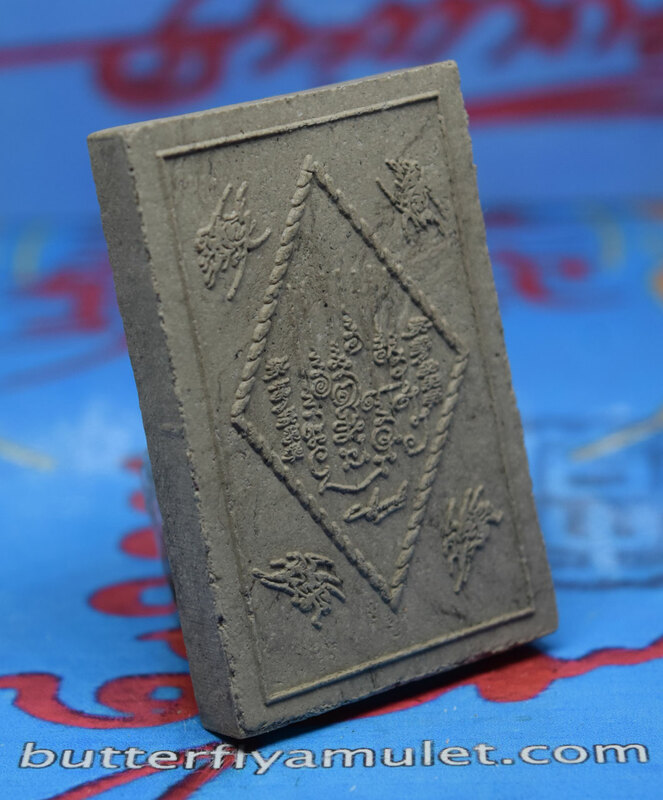 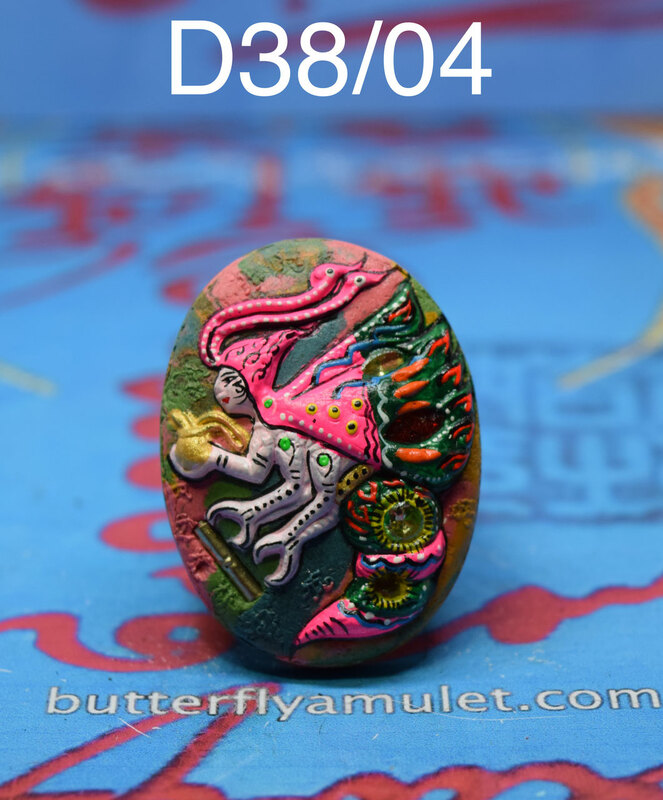 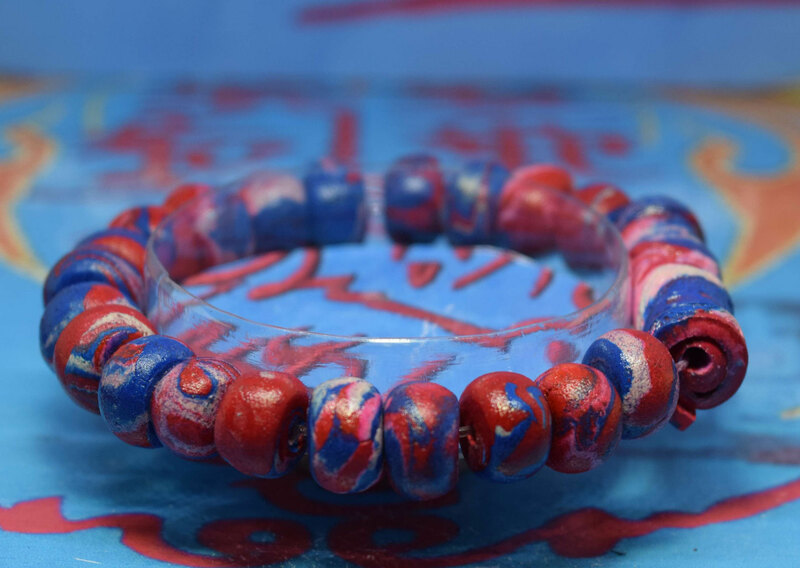 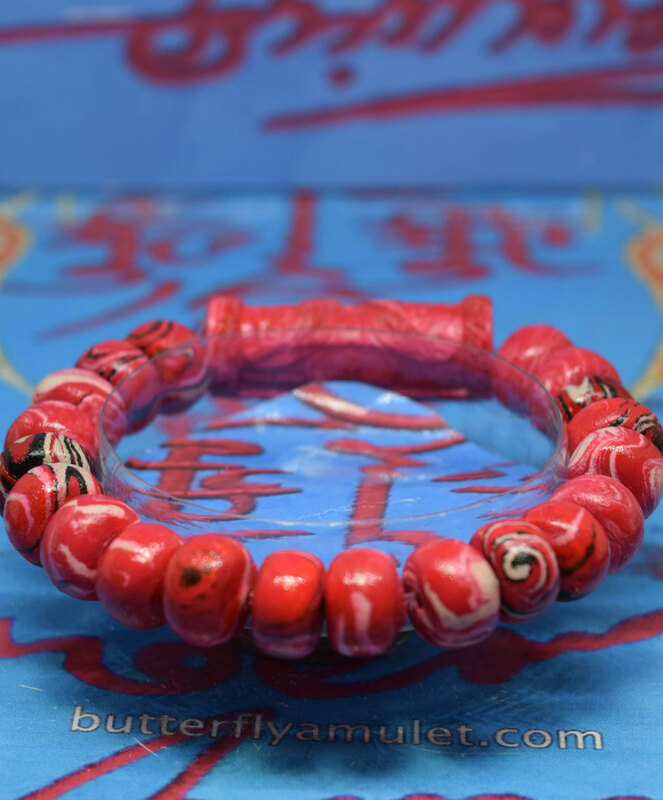 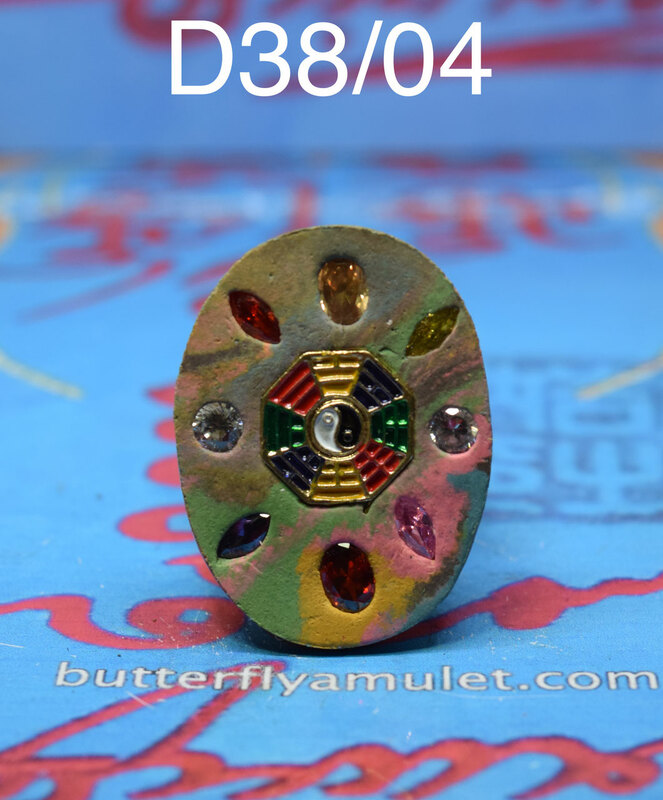 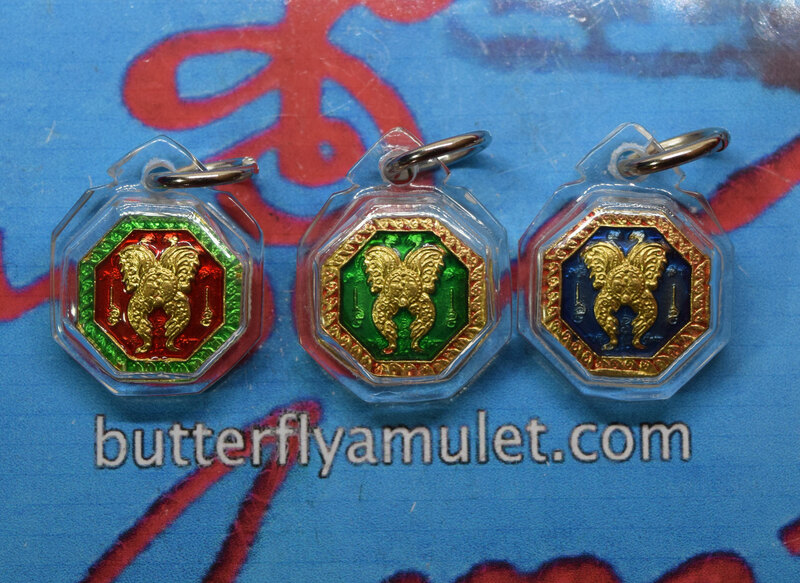 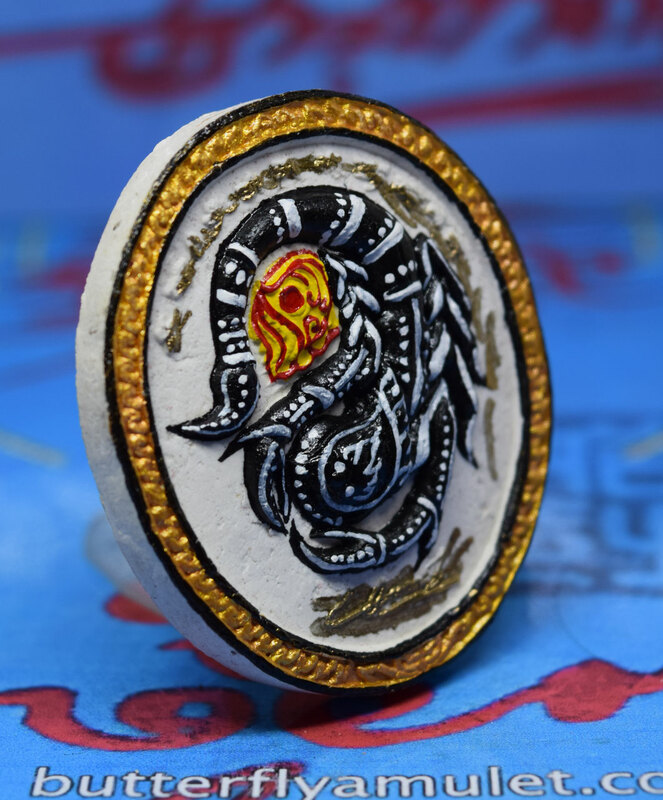 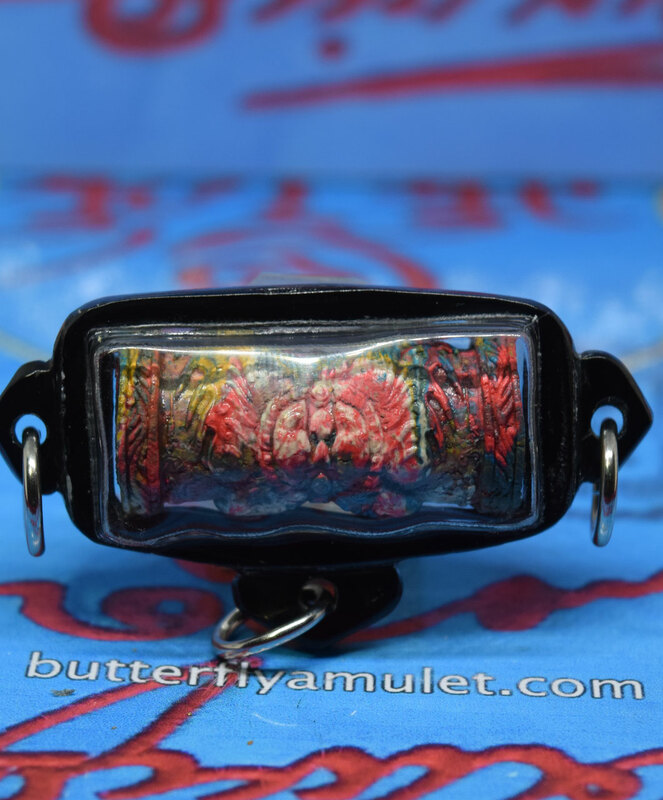 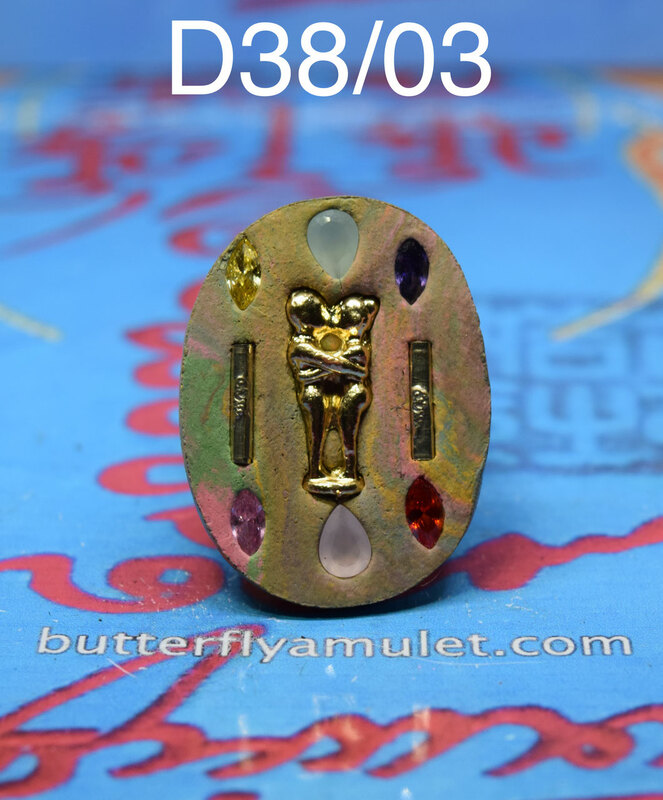 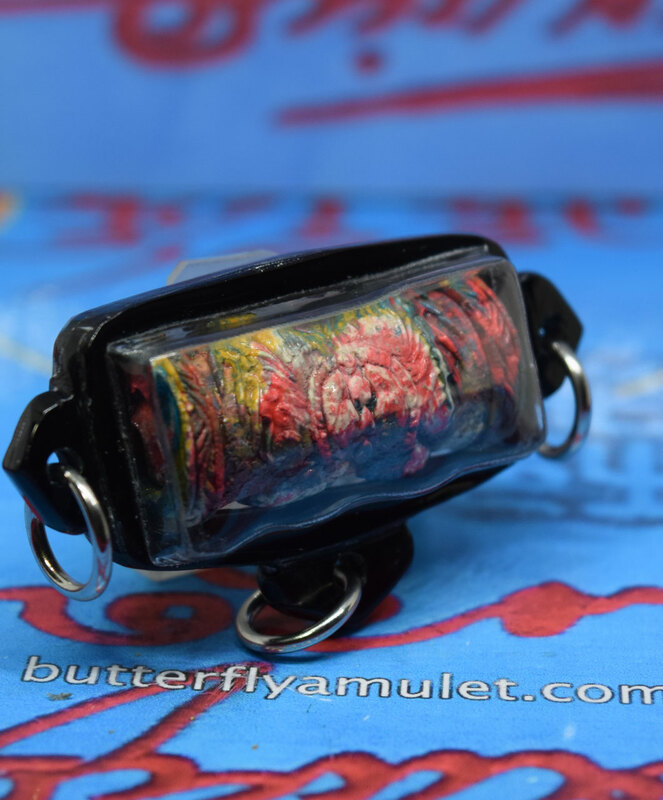 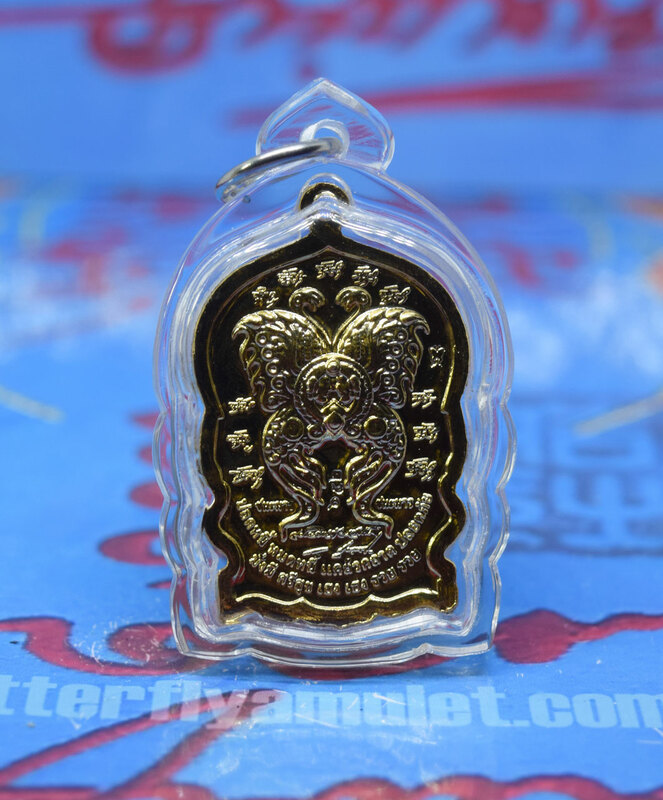 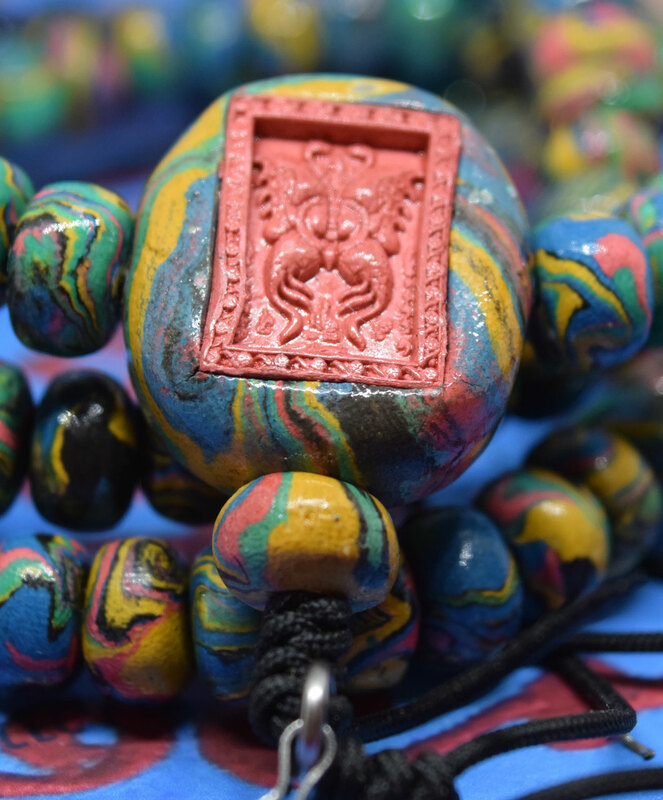 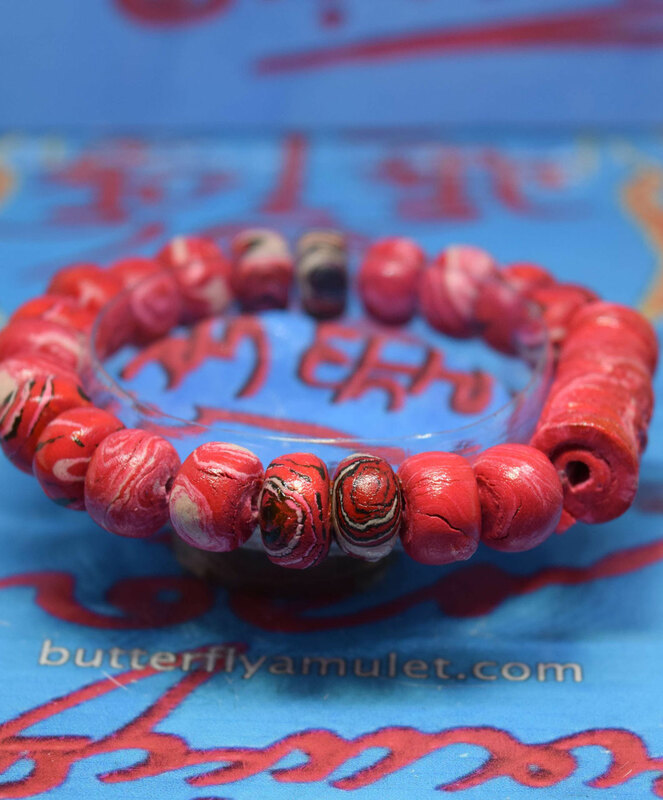 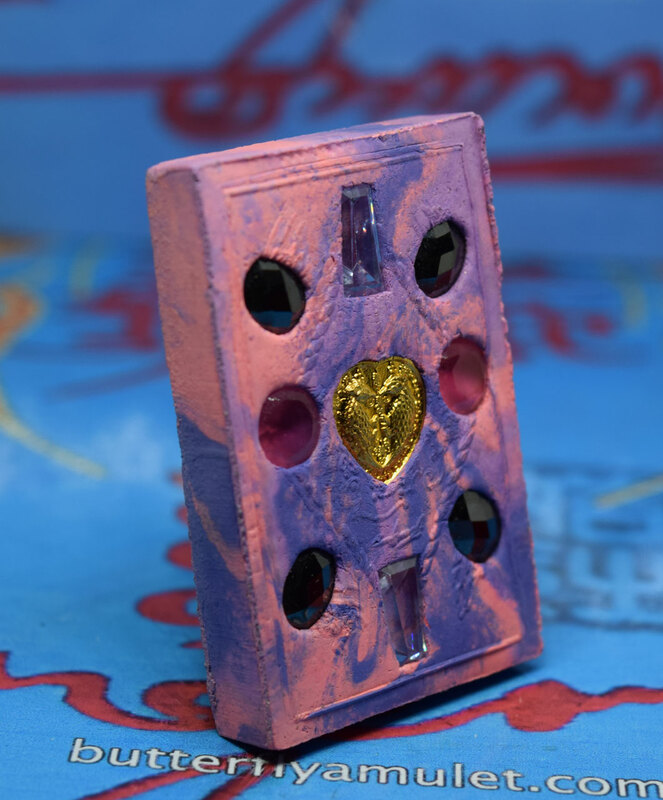 Amulet is approximately 64mm x 44mm made from a mixed colour powder in 2018, BE2561 . 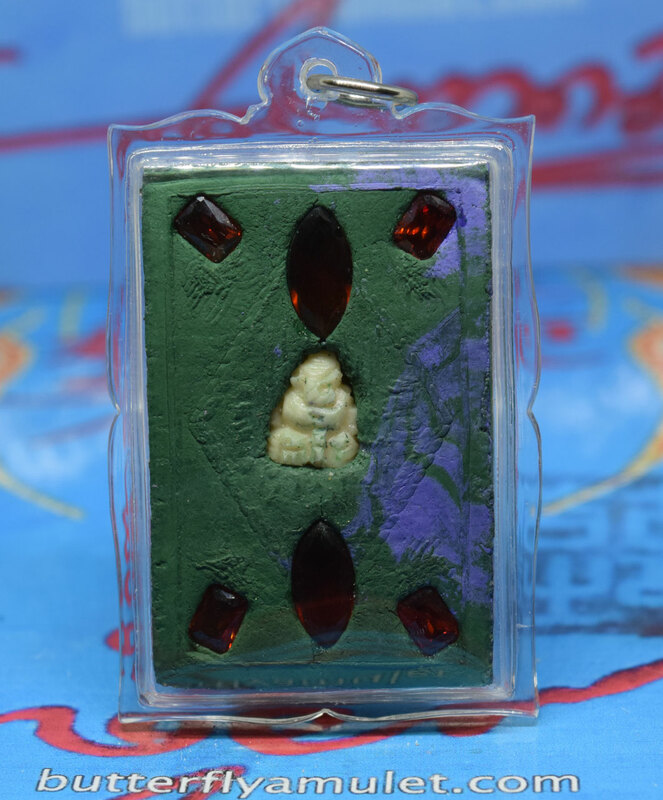 Two large gems , two jade set around the Si-Hoo-Ha-Tha with a temple seal ,gold leaf overlay and a gold globes, set in the reverse side a gold heart shape two salika and eight gems. 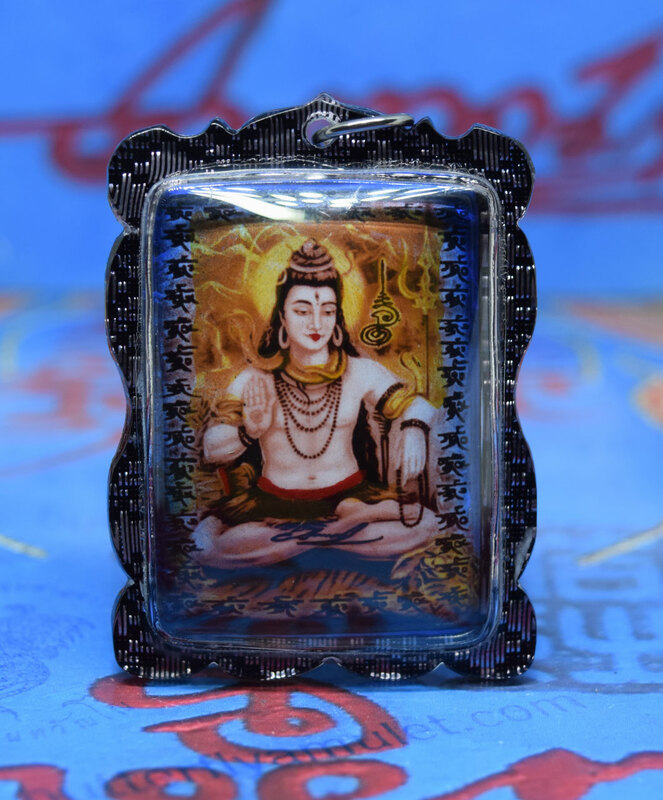 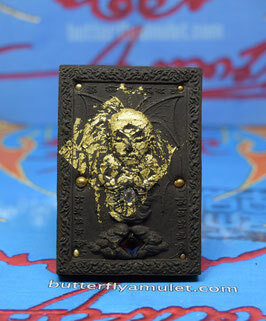 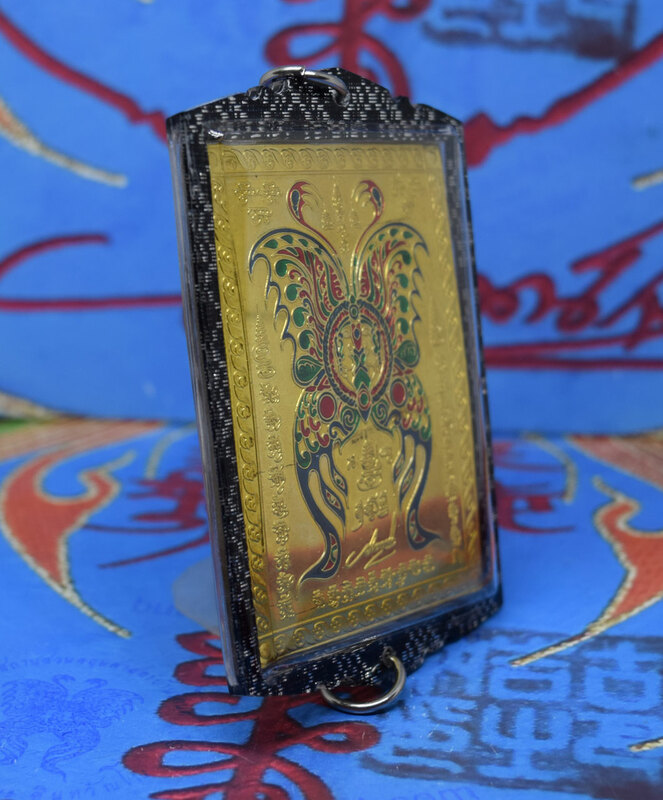 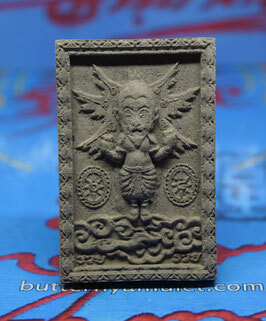 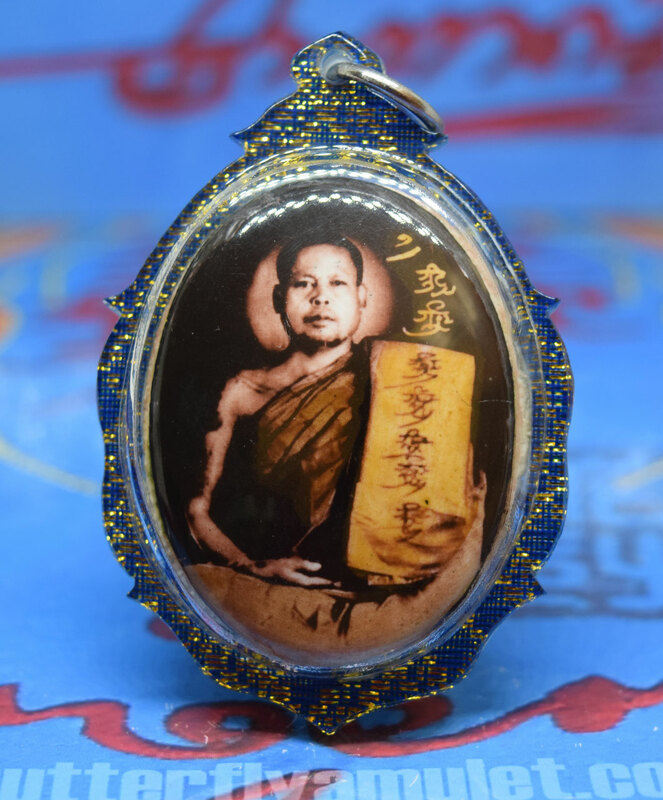 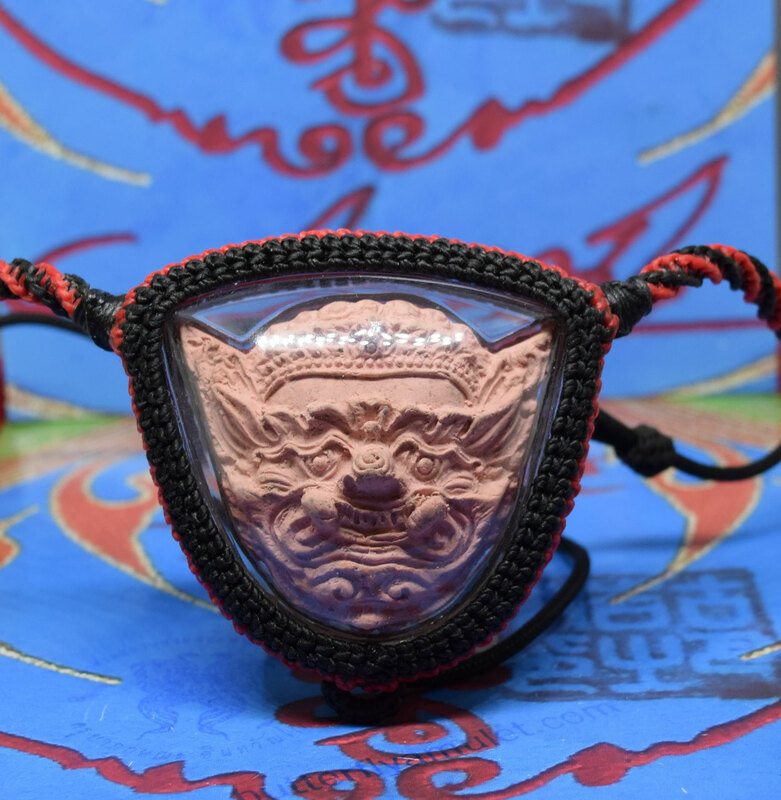 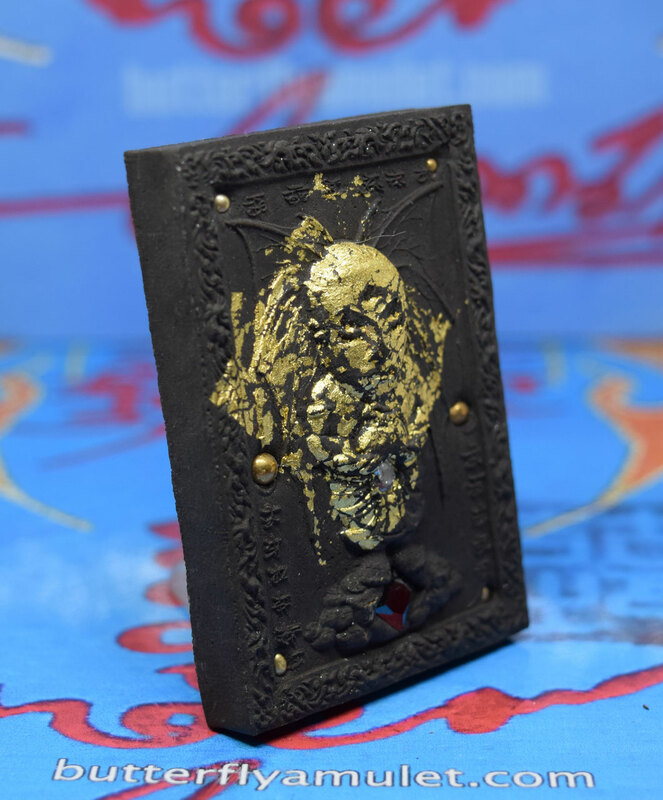 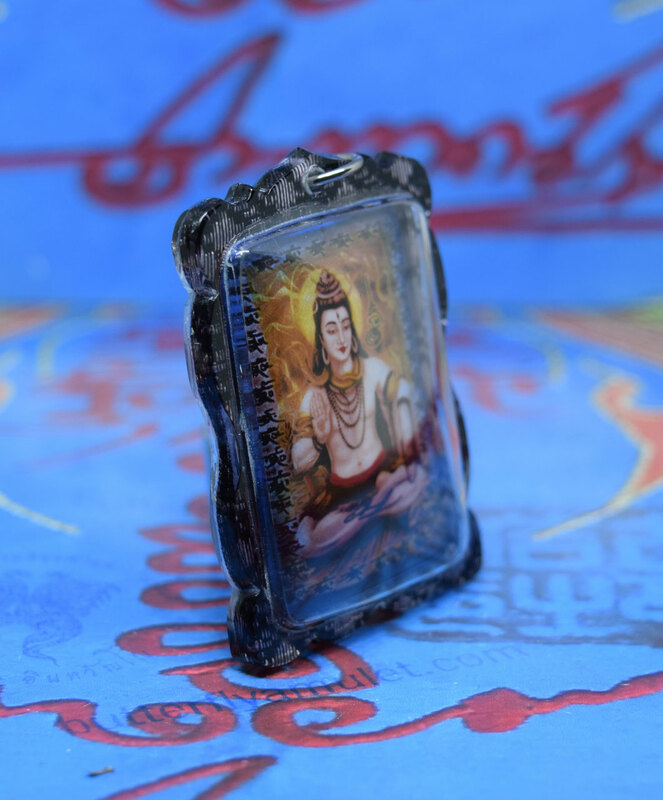 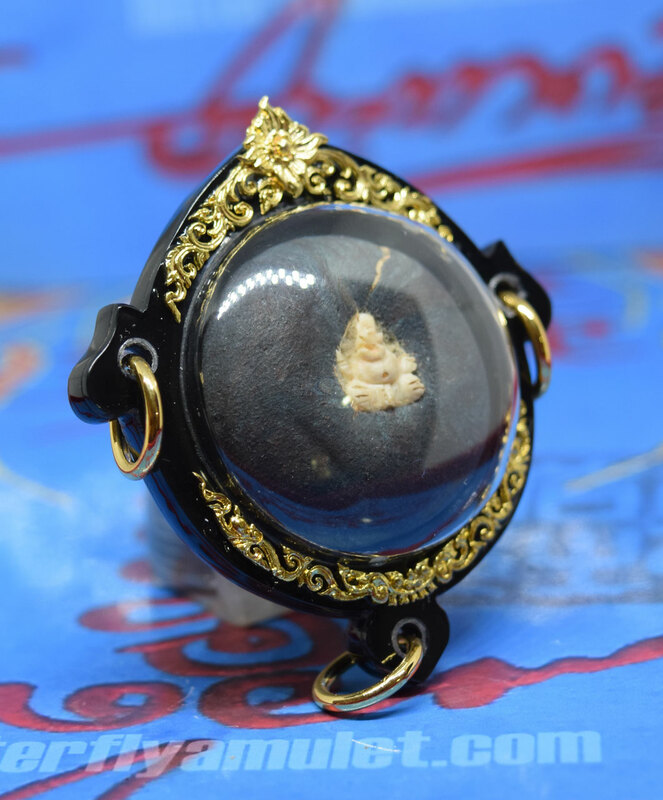 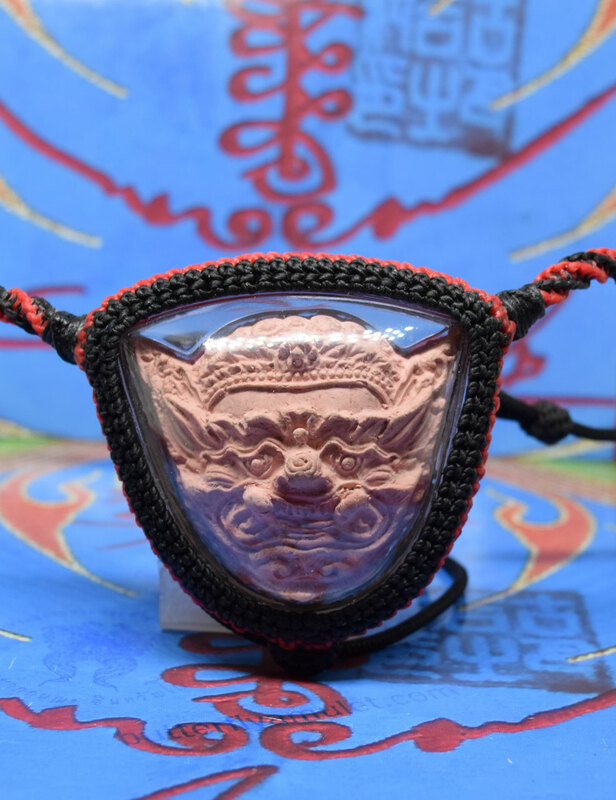 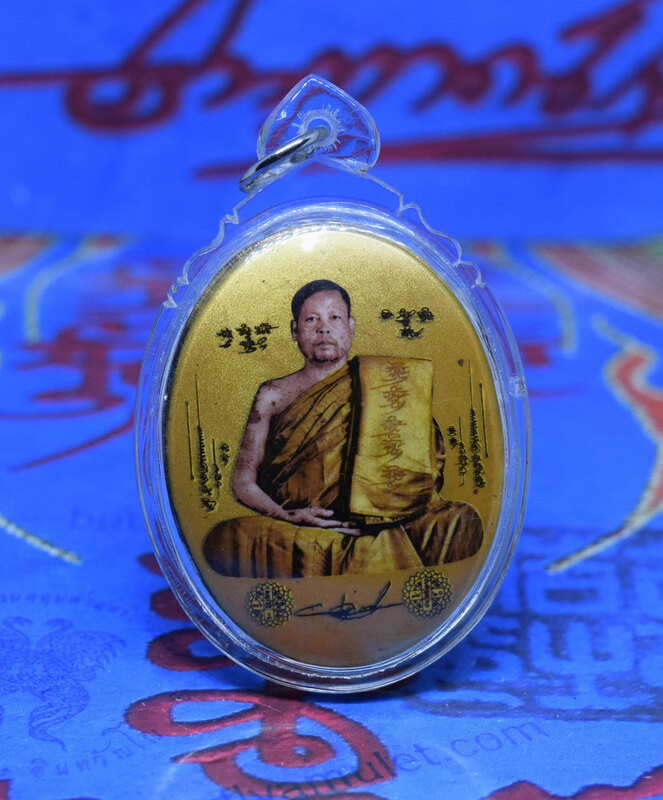 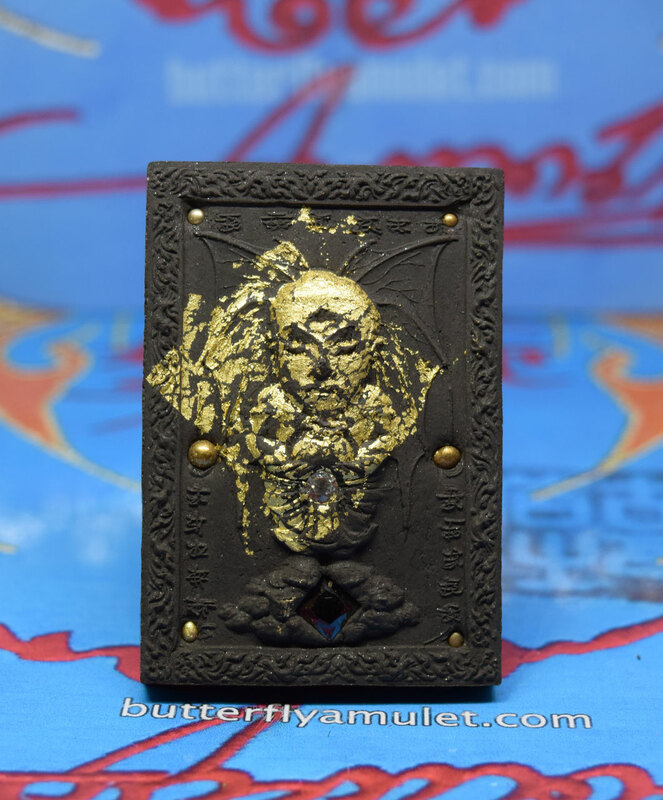 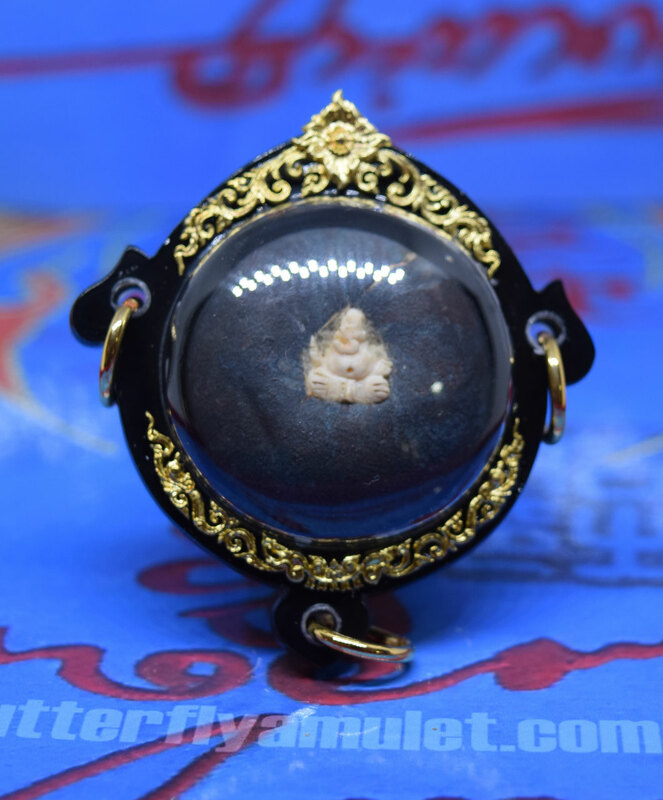 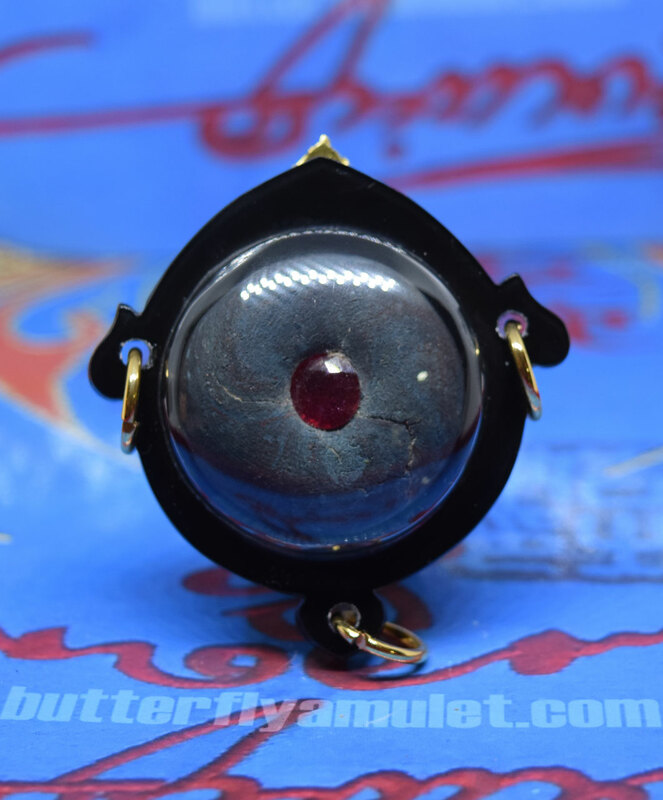 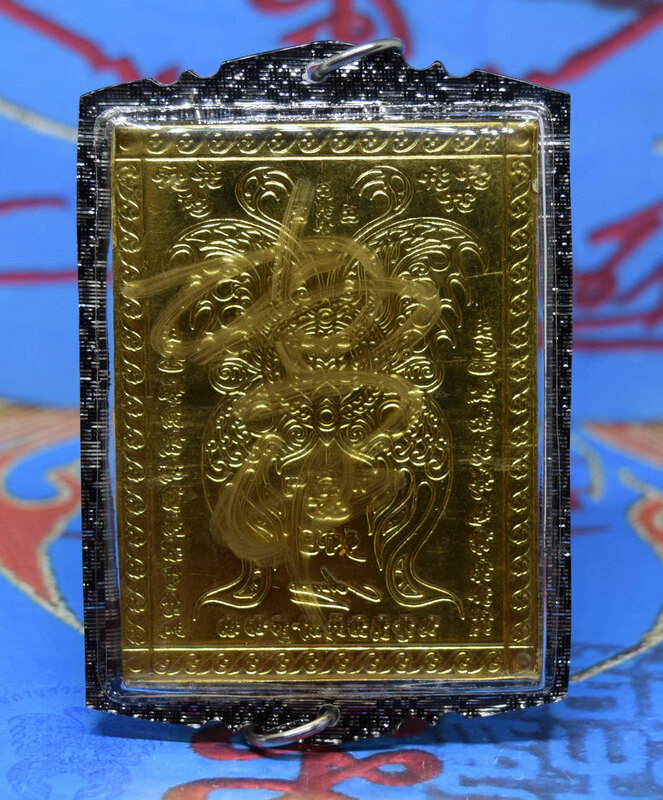 Amulet is approximately 64mm x 44mm made from black powder in 2018, BE2561 . 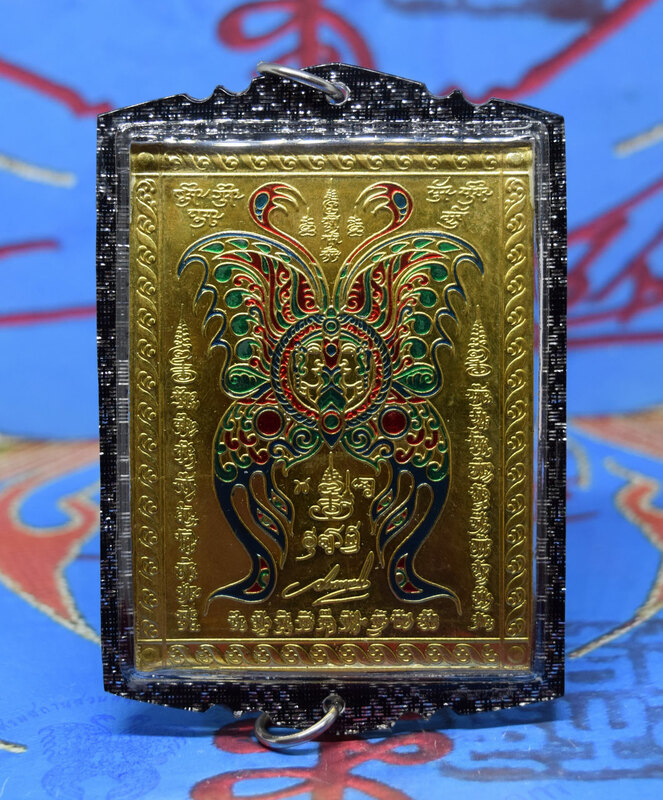 Two gems set around the Si-Hoo-Ha-Tha with gold leaf overlay and six gold globes, set in the reverse side a large gold takrat and six gems with two temple seals. 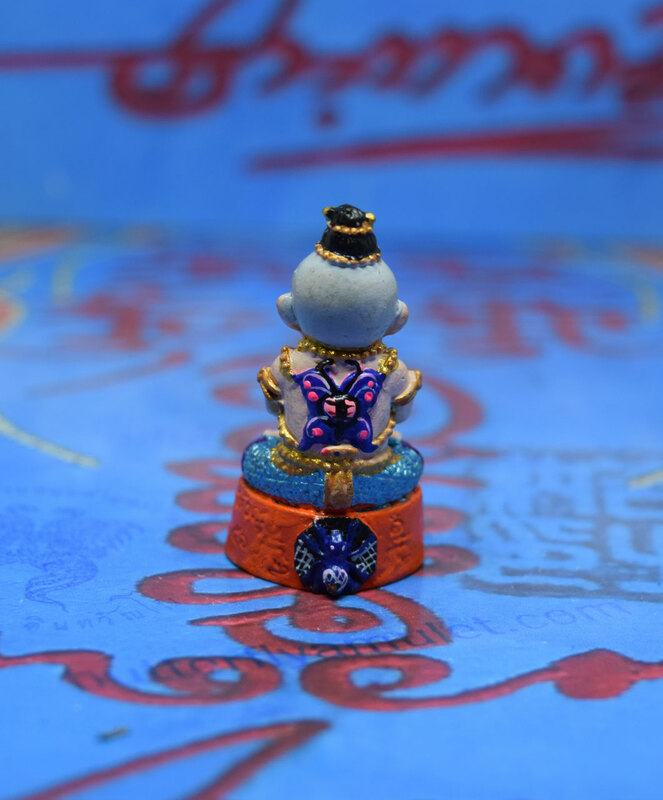 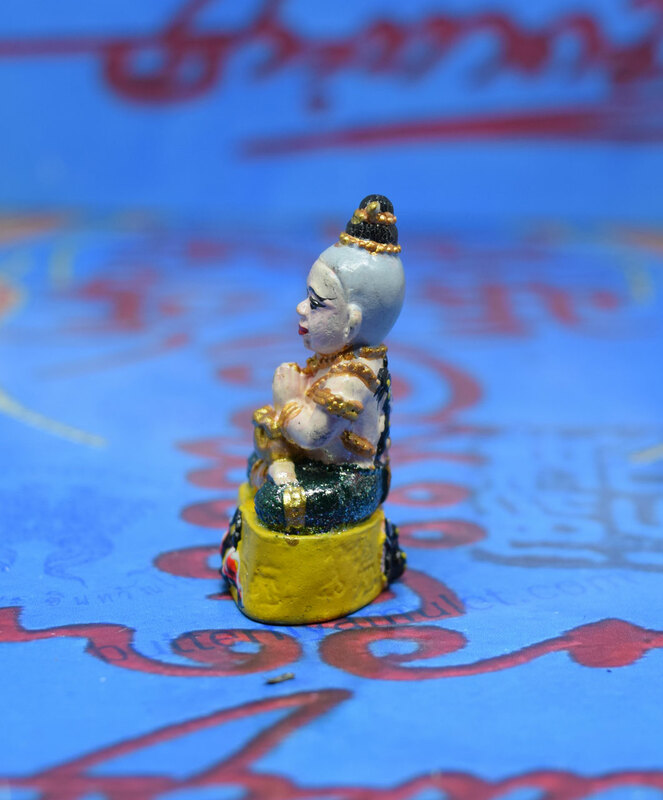 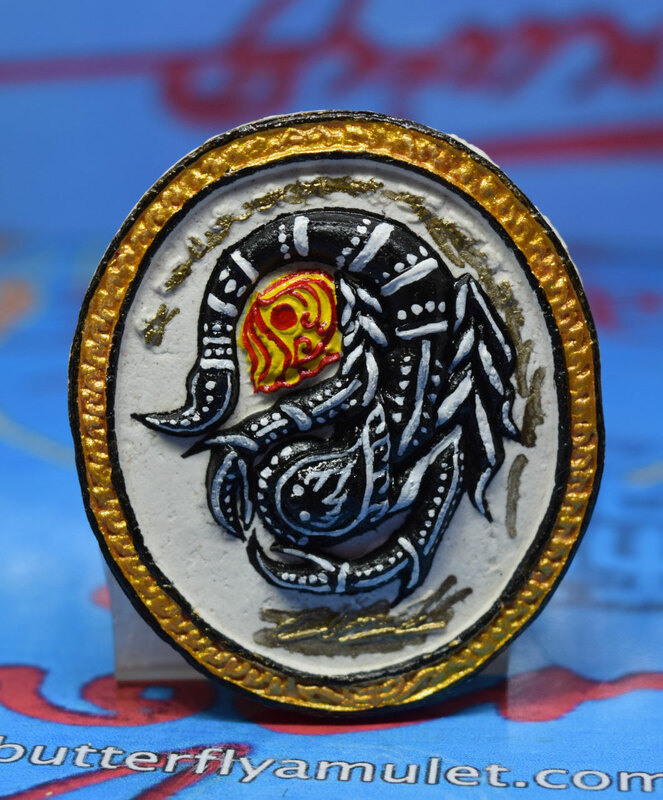 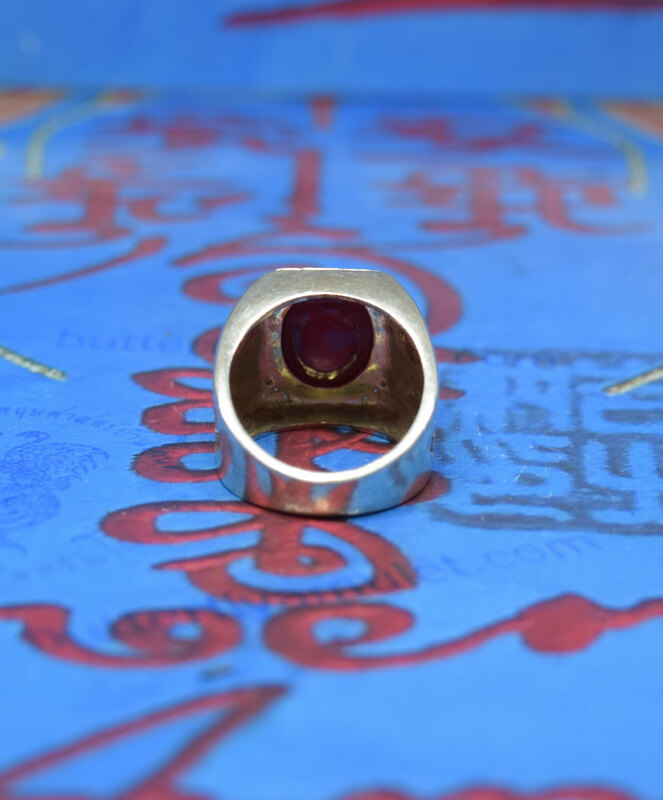 Set in the reverse sided sixteen gems around the Ganesha and embedded inside two takrats. 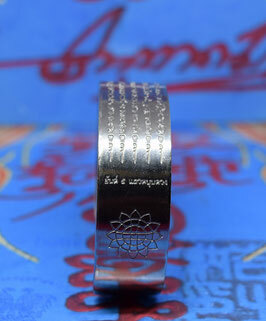 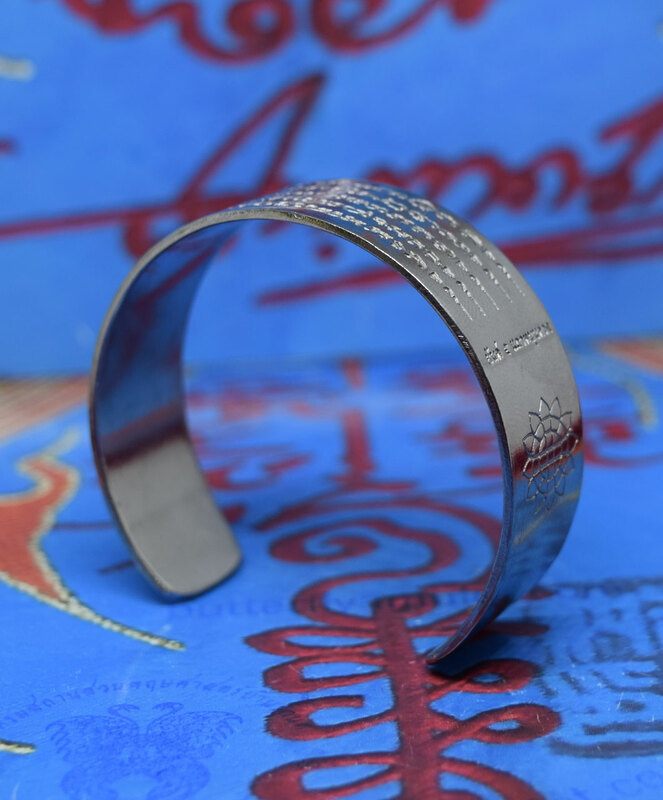 Includes stainless casing or if requested a waterproof casing and International shipping. 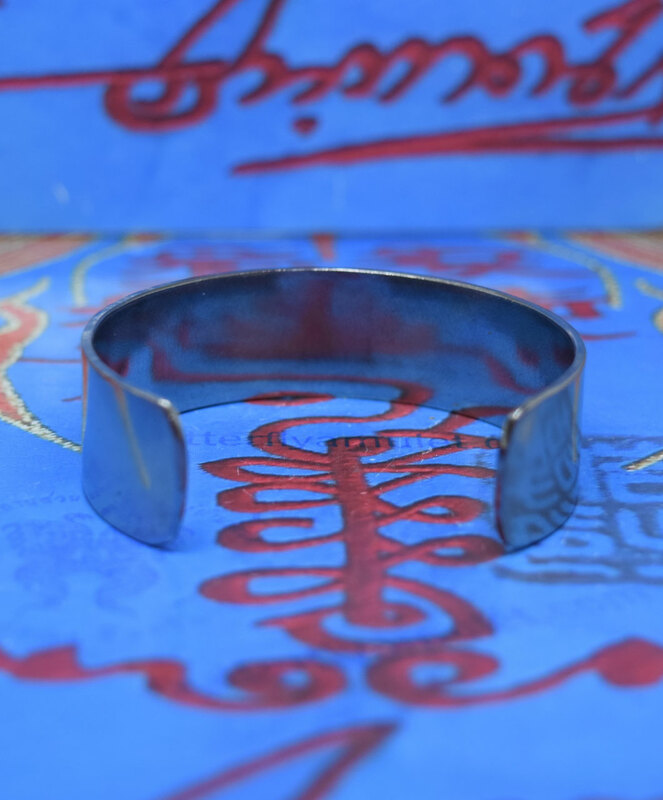 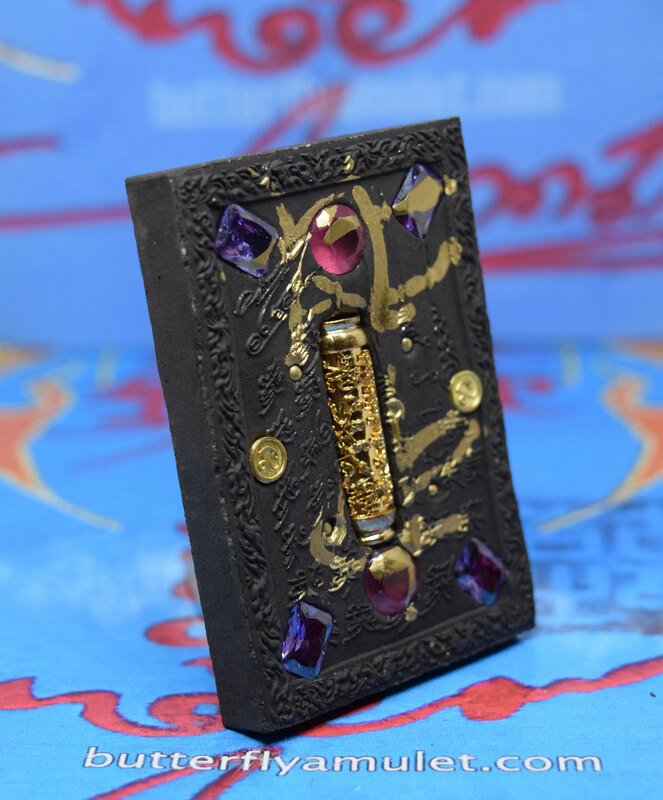 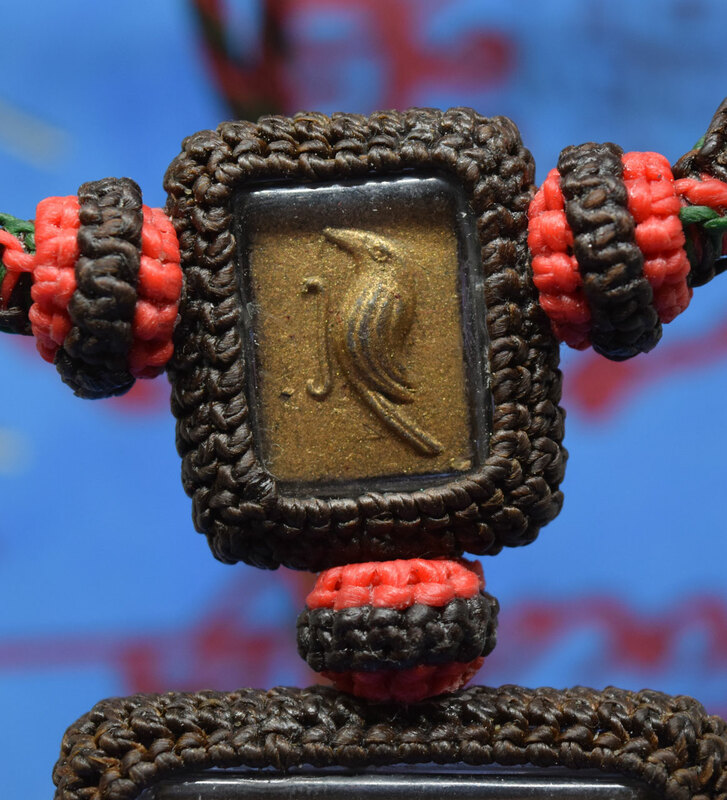 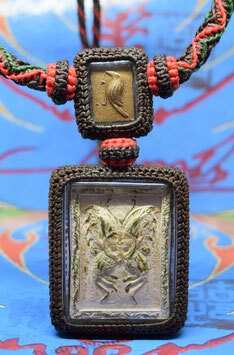 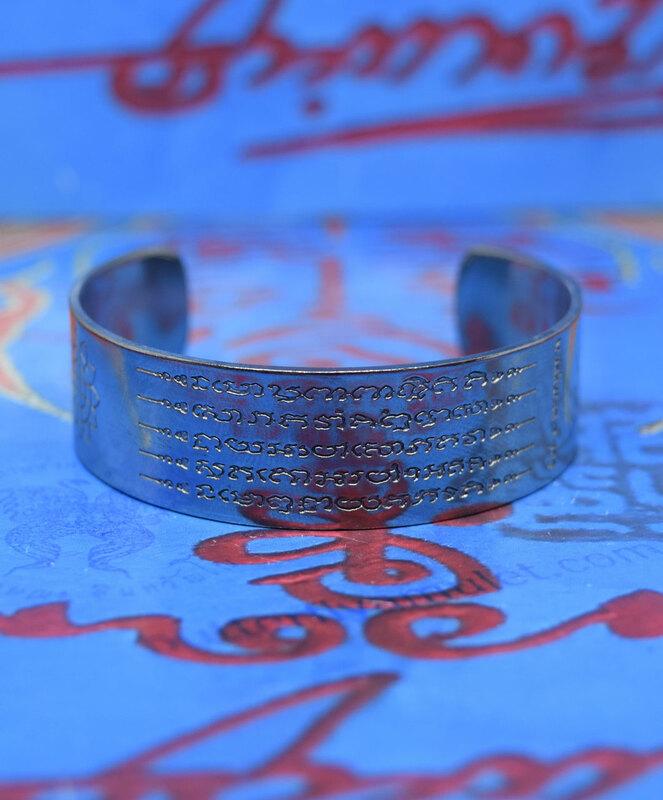 Lersi amulet made by Kruba in 2018 from mixed powder. 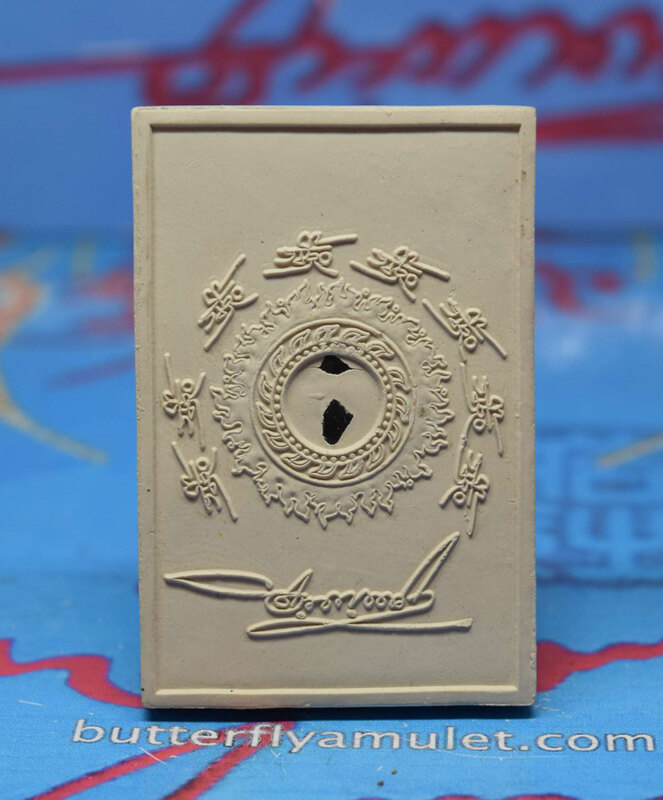 Temple seal on the reverse side. 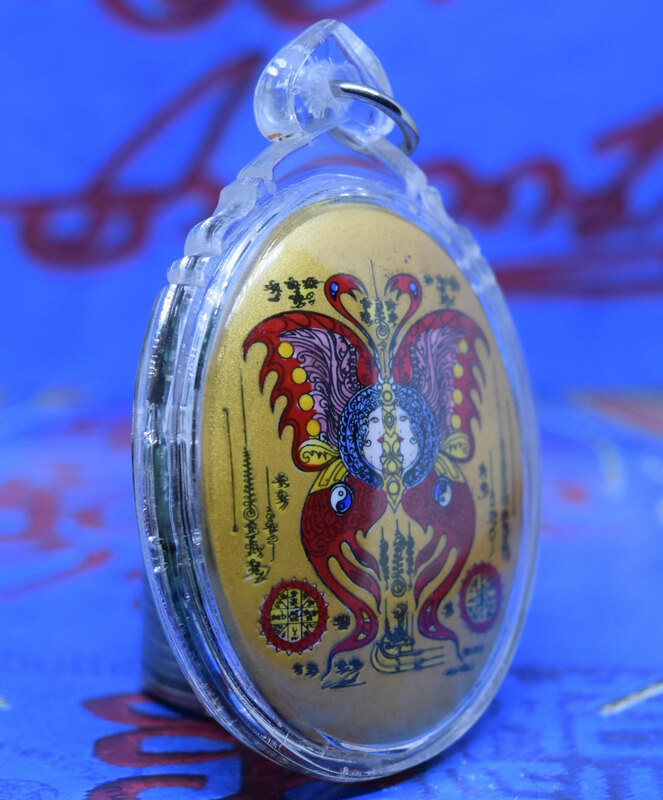 Pressed micron gold foil with painted enamel butterfly on one side and kruba yant on the waterproof casing with two rings top and bottom . 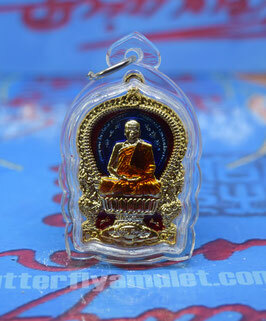 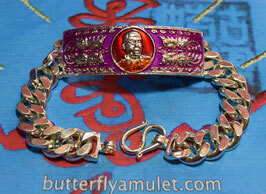 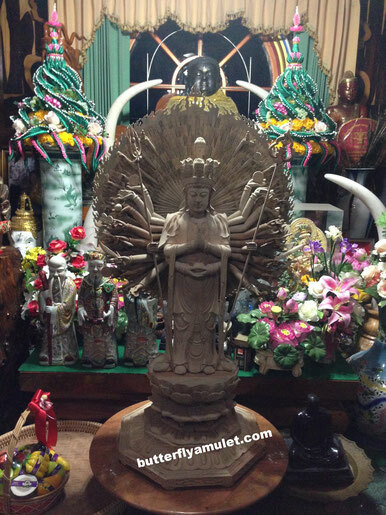 Can be hang inside motor cars for good luck. 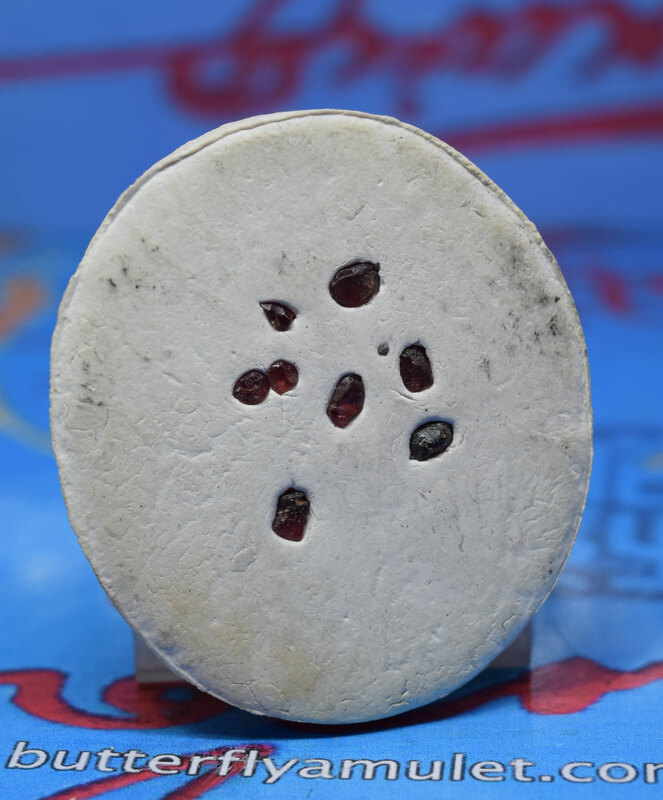 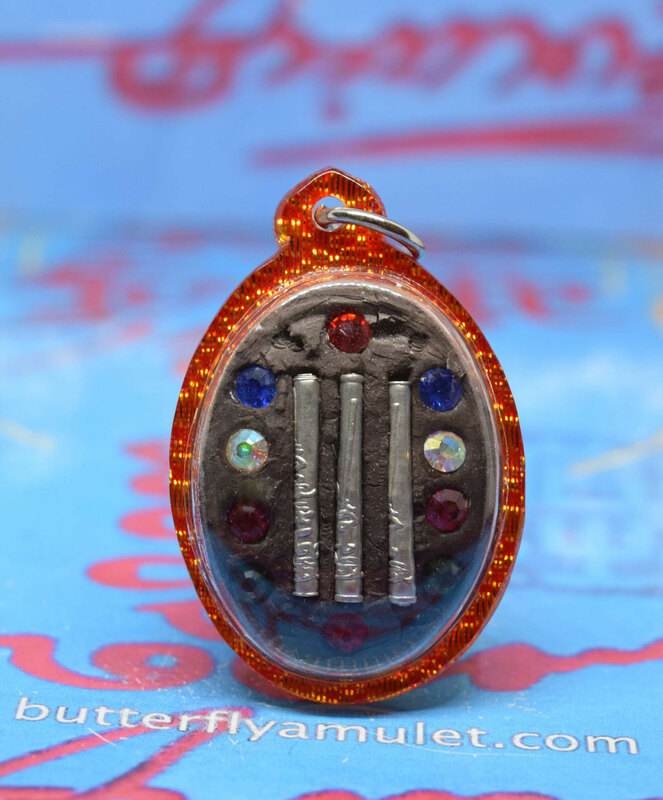 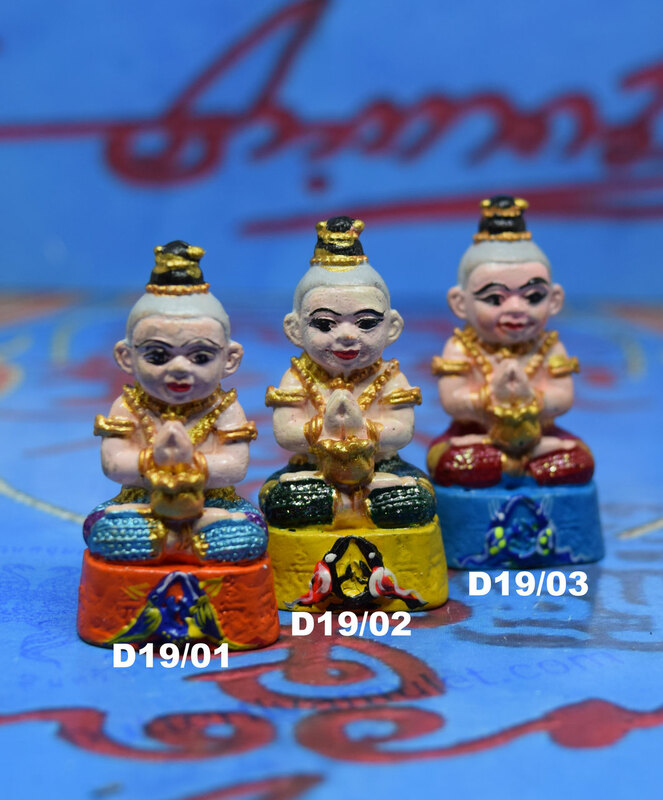 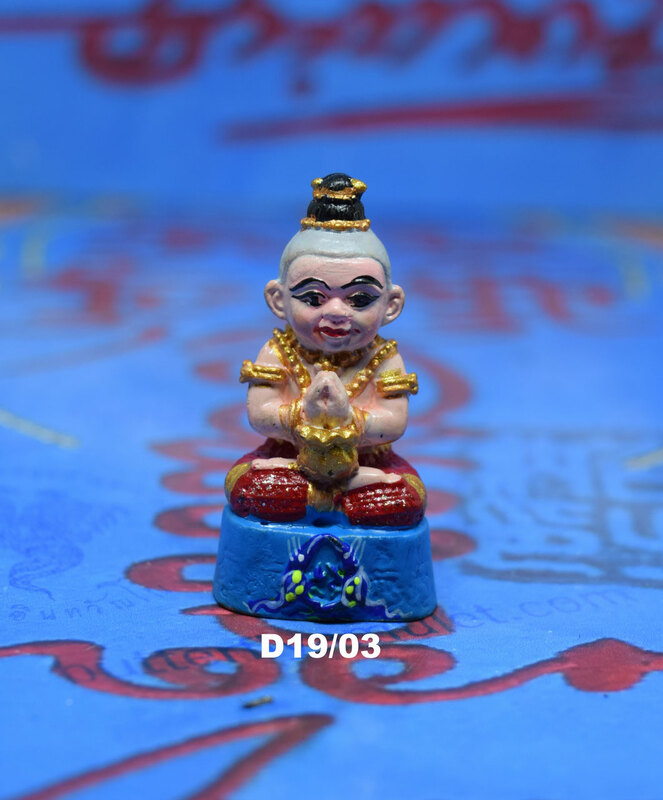 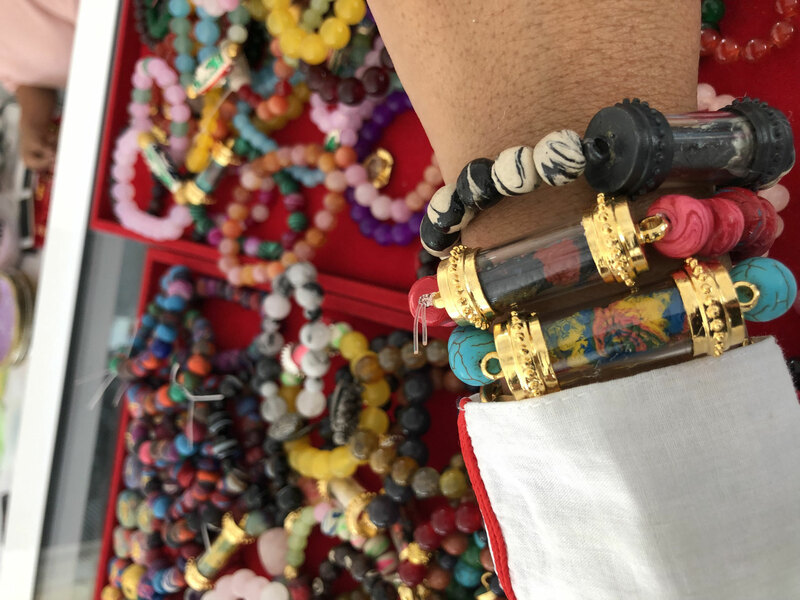 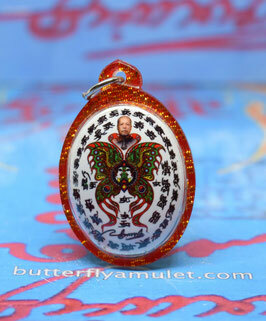 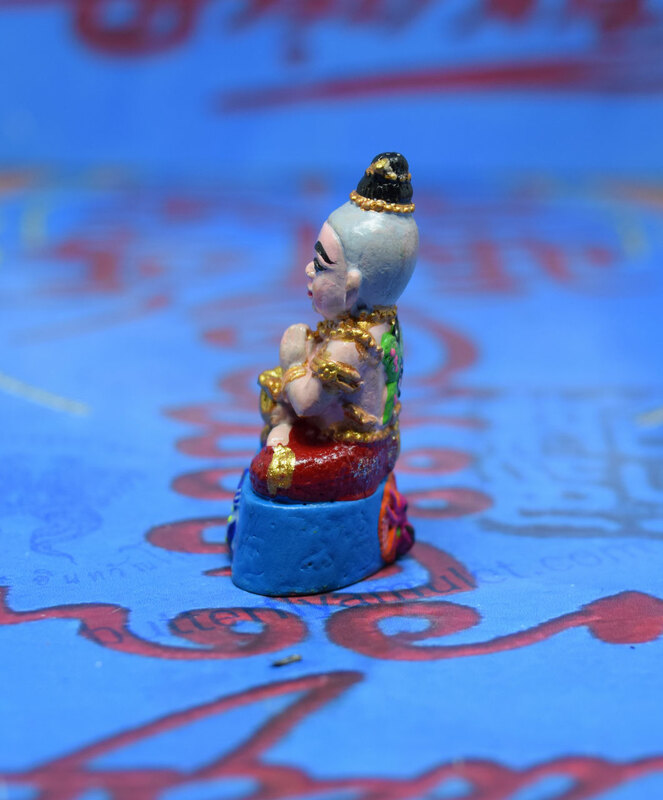 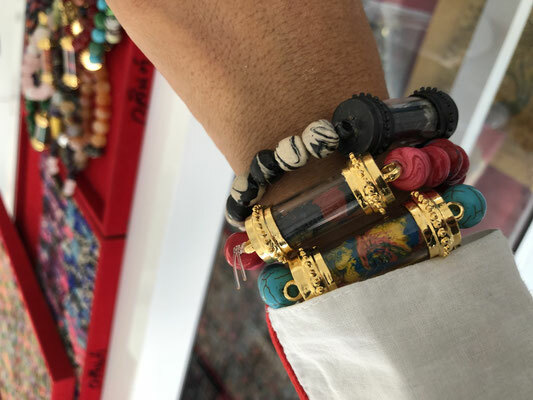 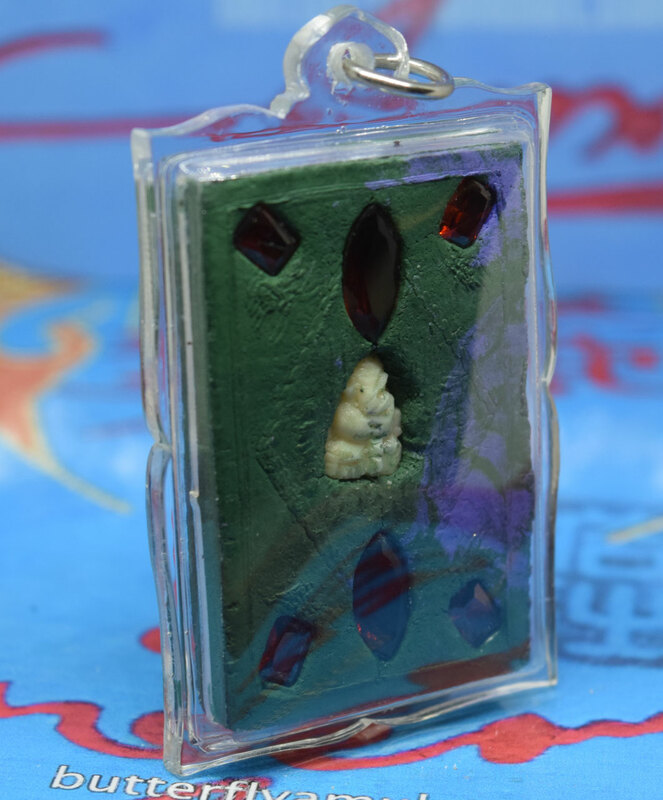 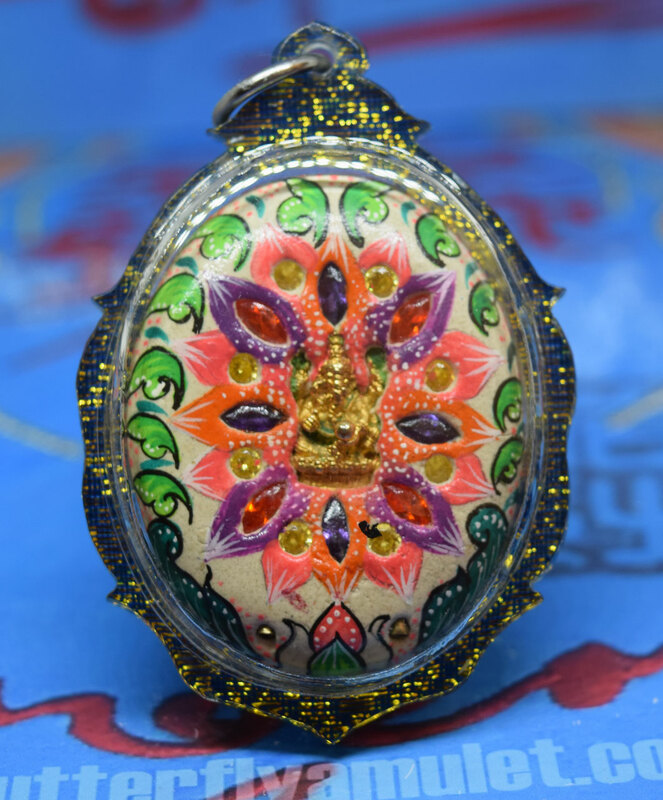 Locket filled with powder with five takrats placed inside the base and around phra phrom eight red gems with gold leaf. 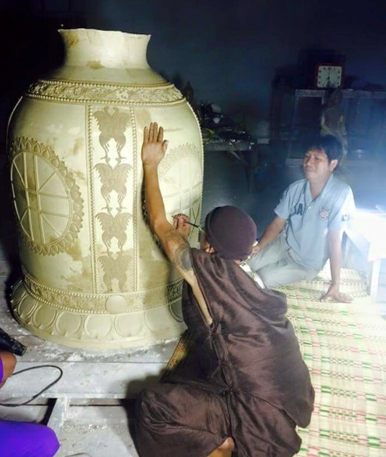 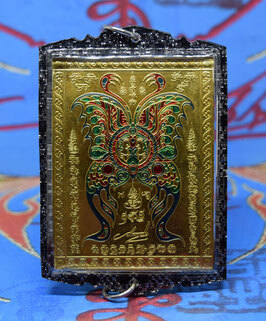 Cast metal kumantong filled with powder with a takrat placed inside the base. 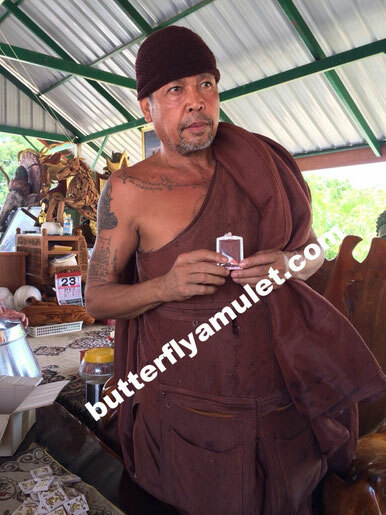 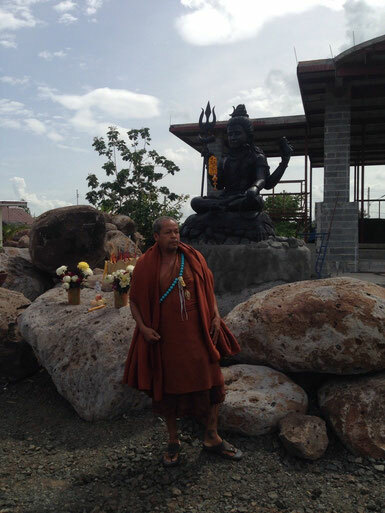 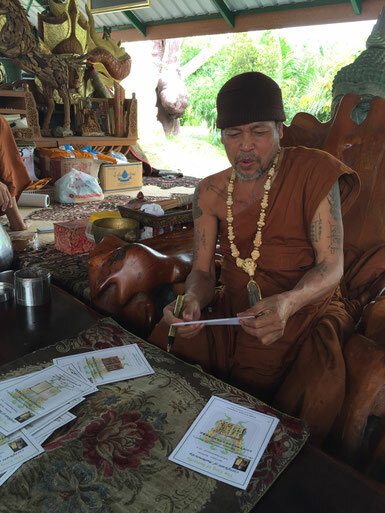 Kuman has a butterfly on his back and sits on a mount with a money spider and salika. 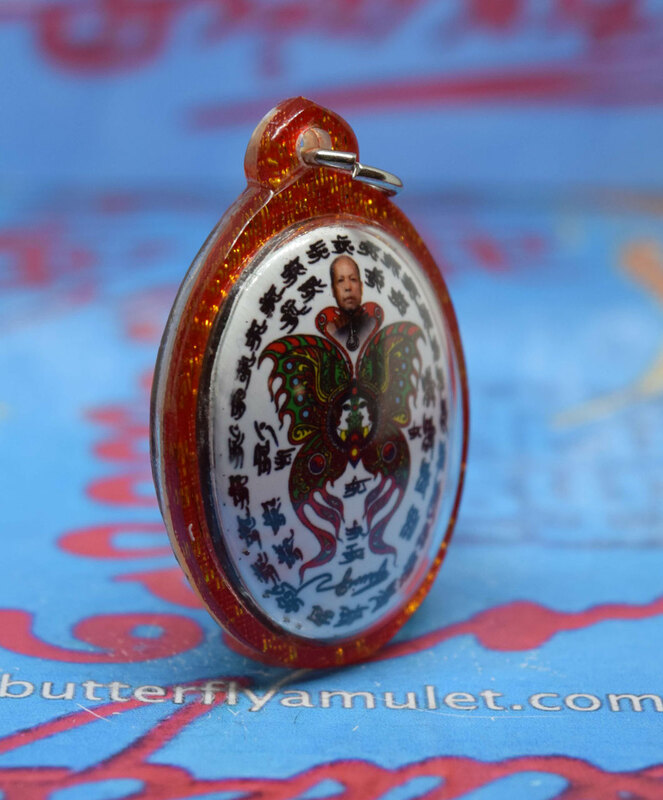 Locket Kruba and Butterfly with green powder between and silver takrats Waterproof casing, free international shipping. 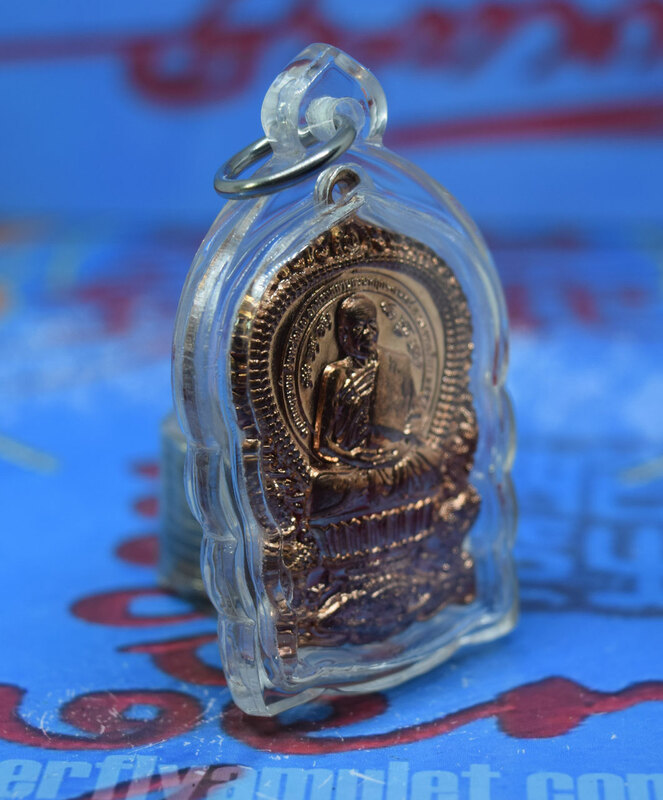 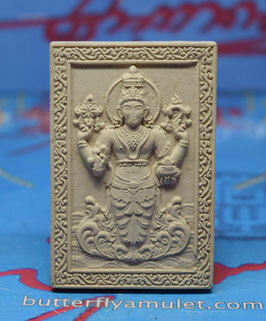 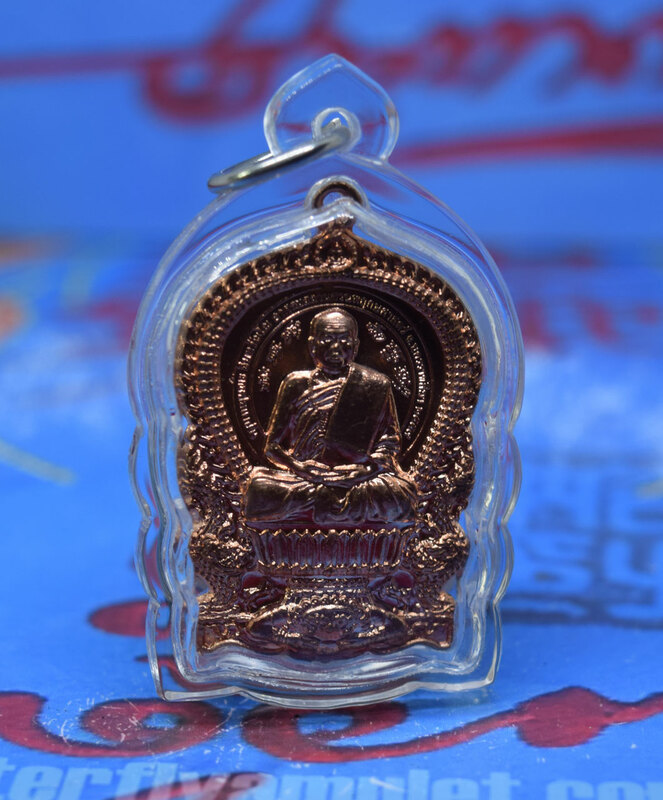 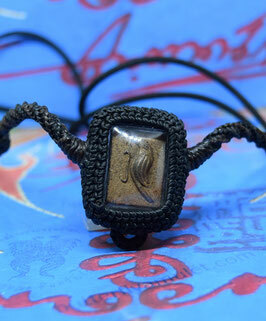 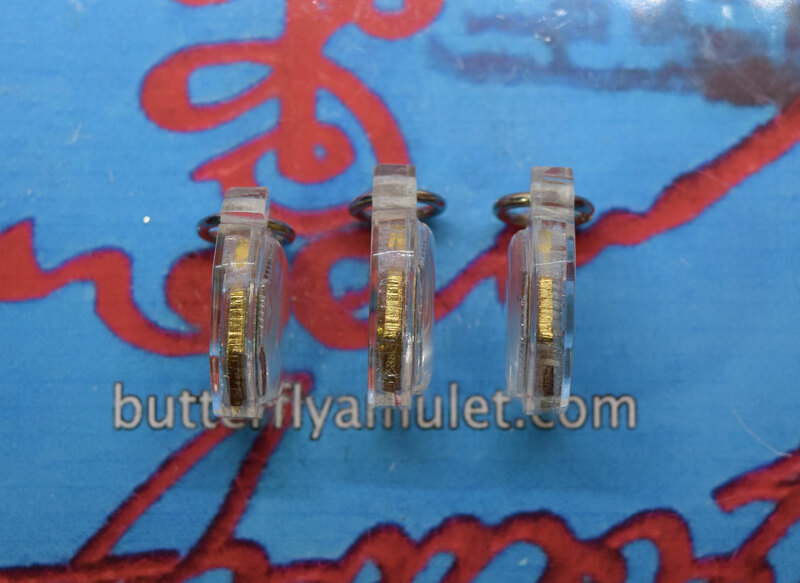 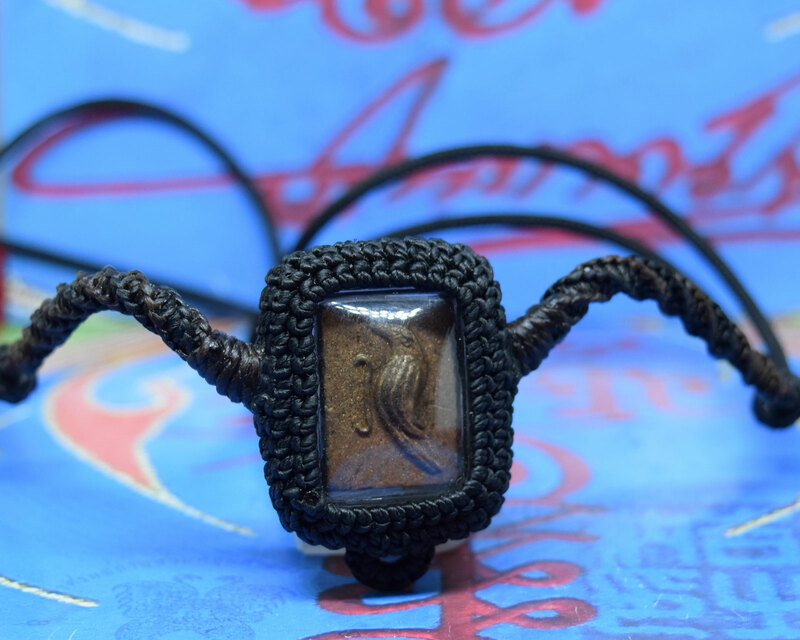 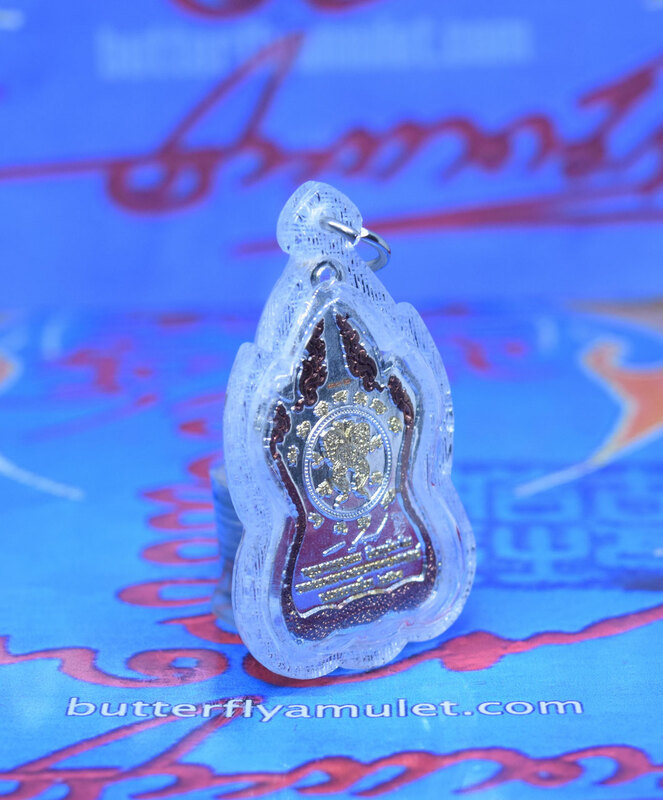 Amulet is approximately 21mm x 15mm made from brown powder in BE2556. The amulet with a single salika in the center, on the reverse side Yant, from Buriram Temple. 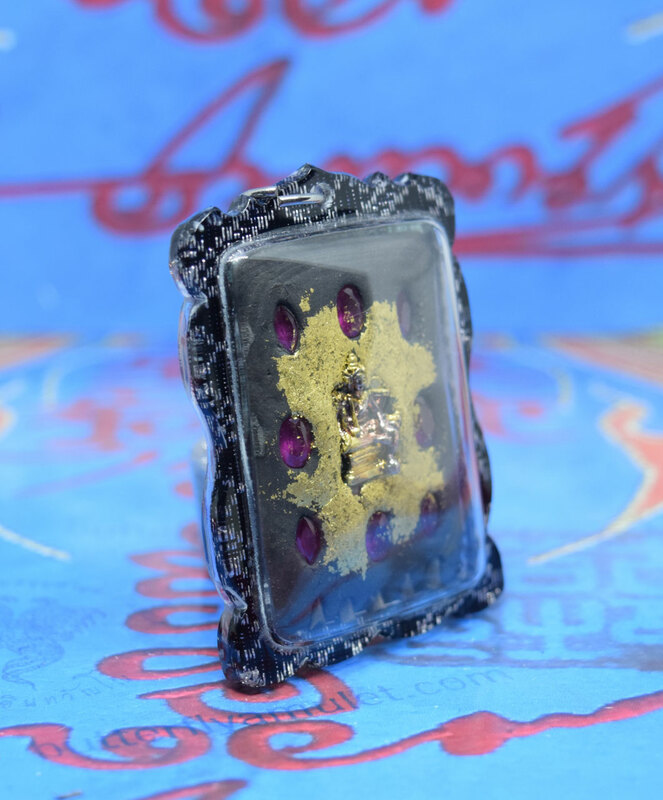 Waterproof casing. Salika are approximately 23mm x 23mm made from white powder in 2014, BE2557.Set in the front single gem, set in the back eight gems and Phra Phrom. 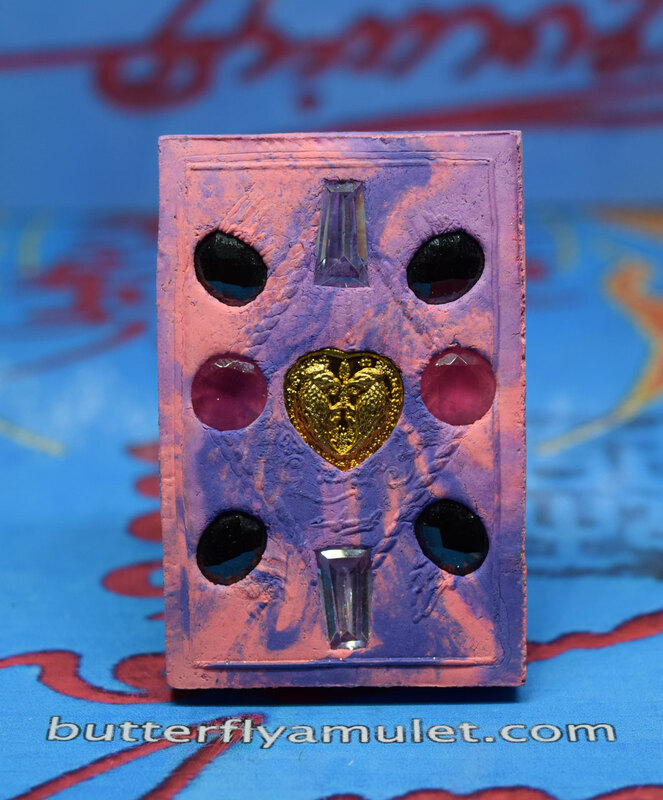 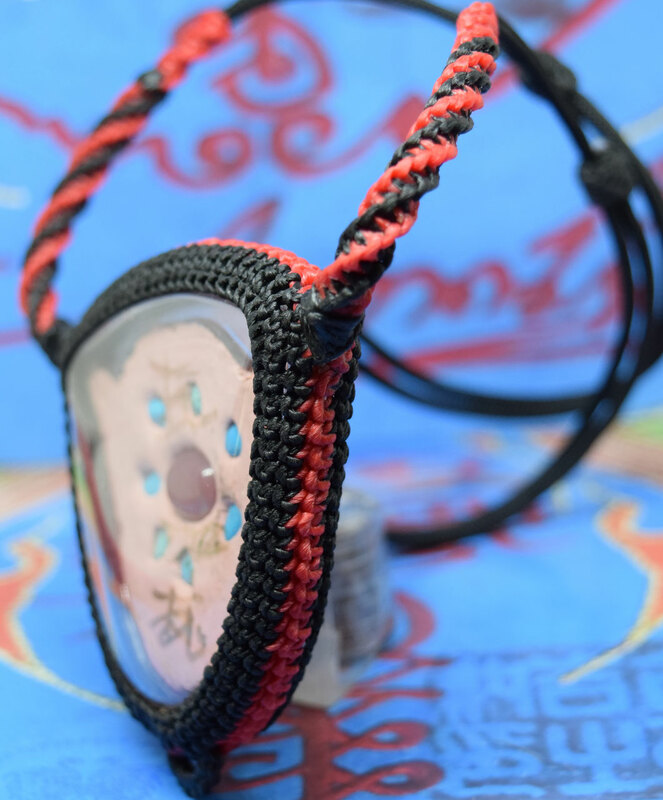 Center piece amulet complete with necklace and eye for attaching an additional amulet. 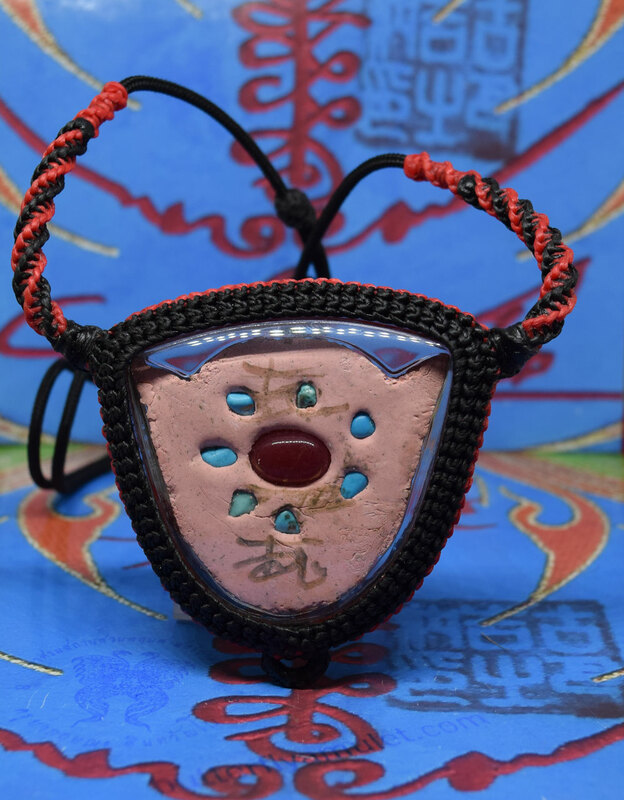 Necklace is approximately 45mm x 52mm made from pink powder in 2016, BE2559. 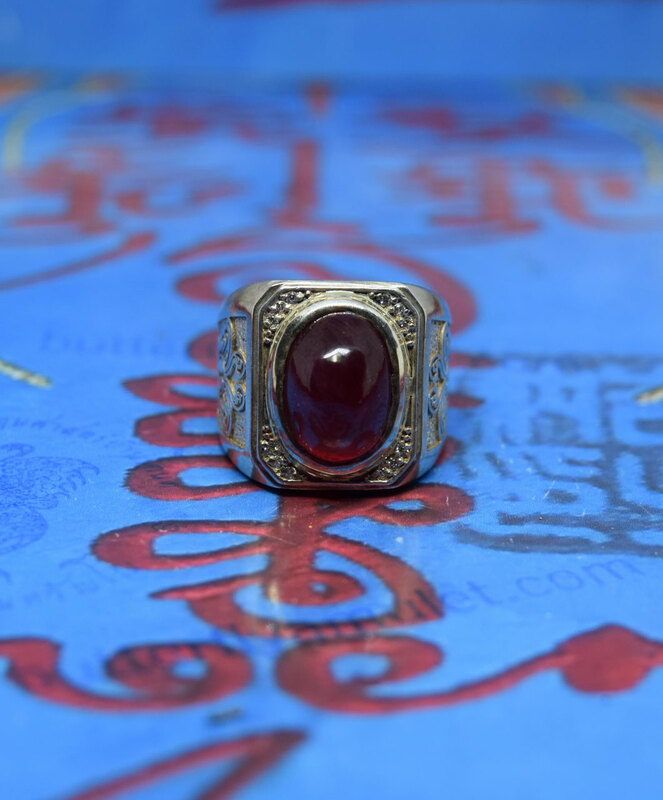 Set in the back a gem stone and yant signed by Kruba. 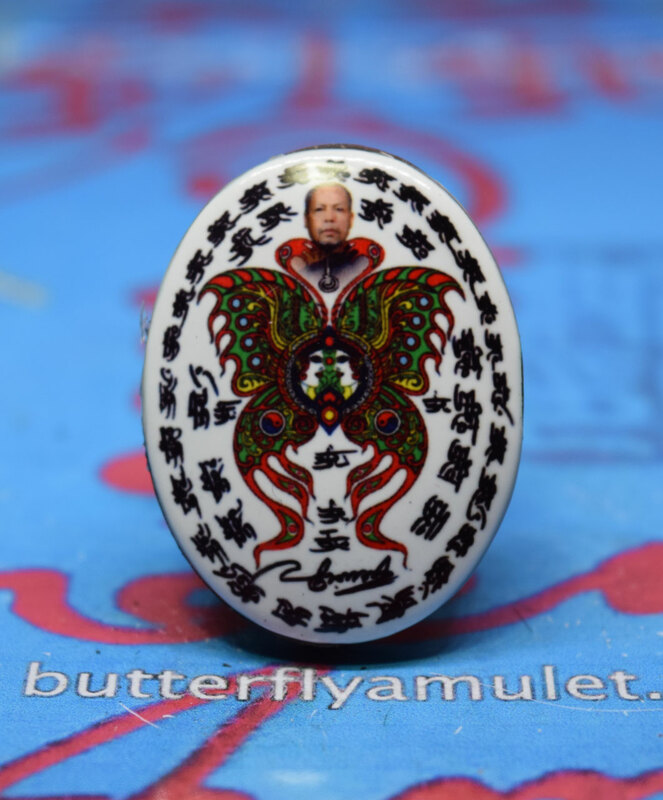 Butterfly takrat approximately 38mm x 15mm made from white powder in 2016 BE2559. 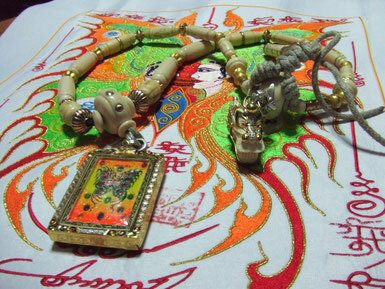 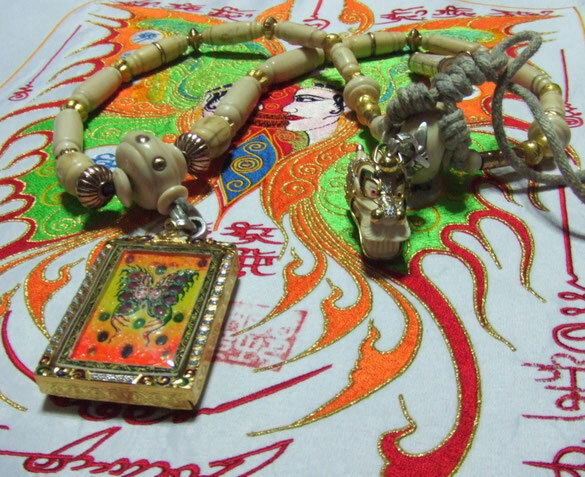 Casing is waterproof with lacing and necklace is 60cm long. 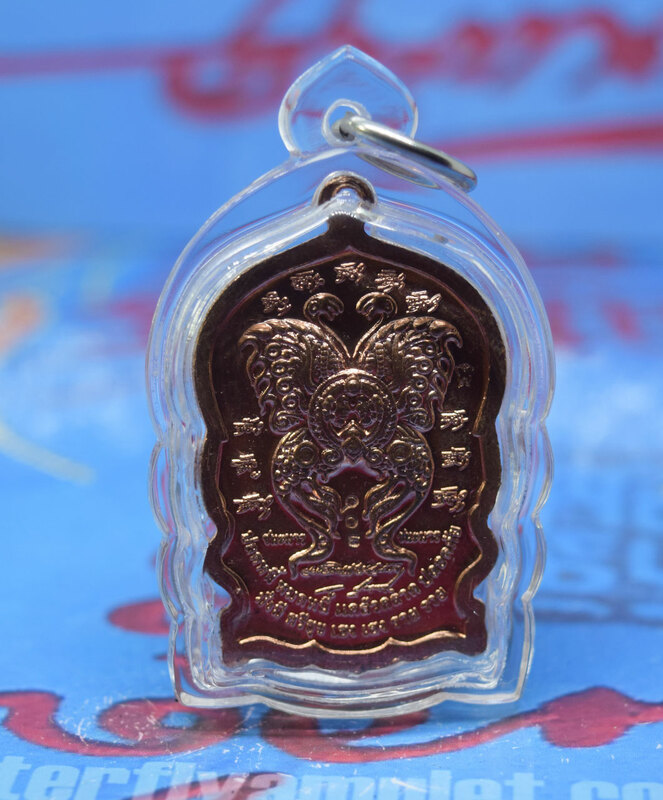 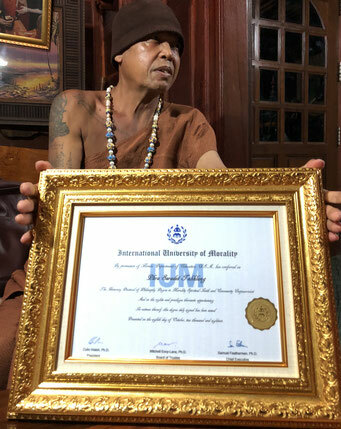 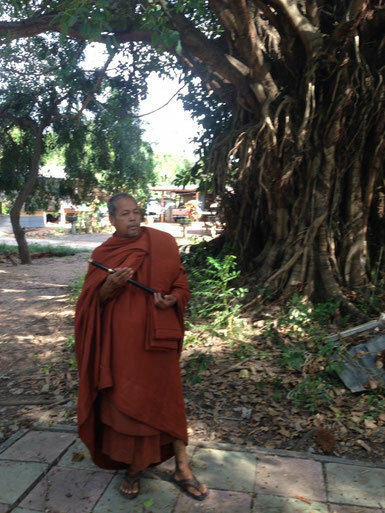 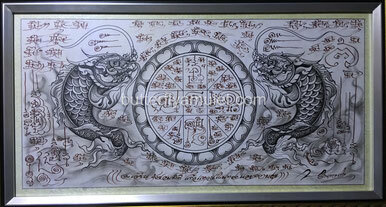 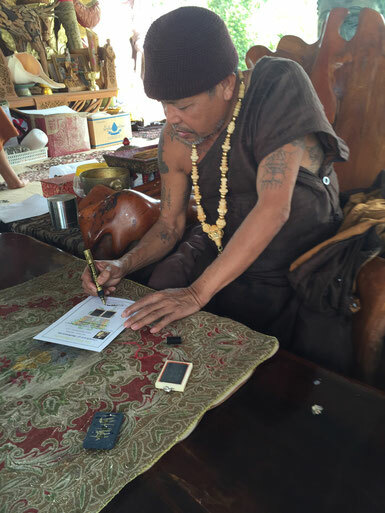 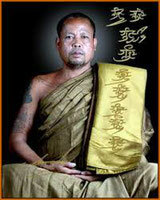 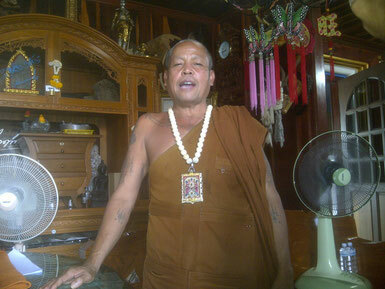 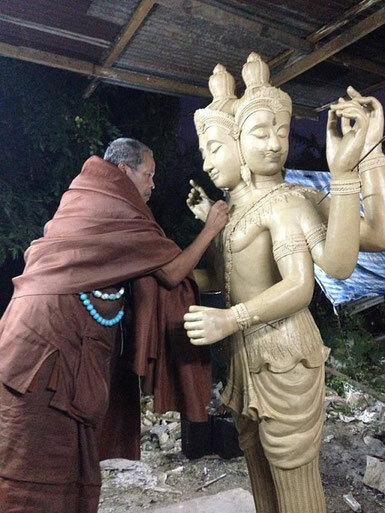 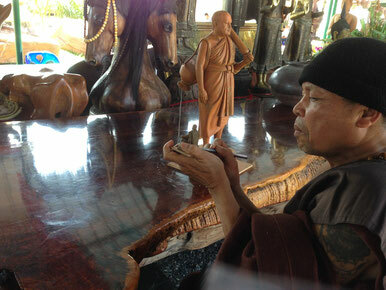 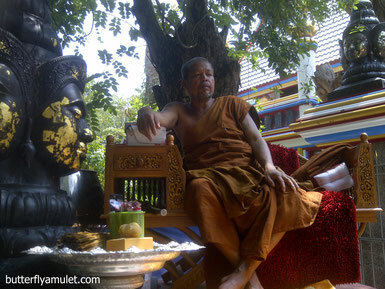 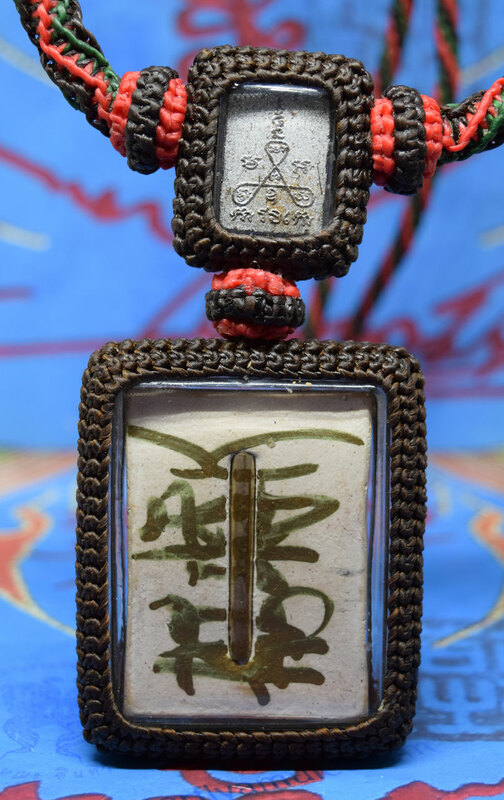 The top amulet is approximately 21mm x 15mm made from brown powder in BE2556. 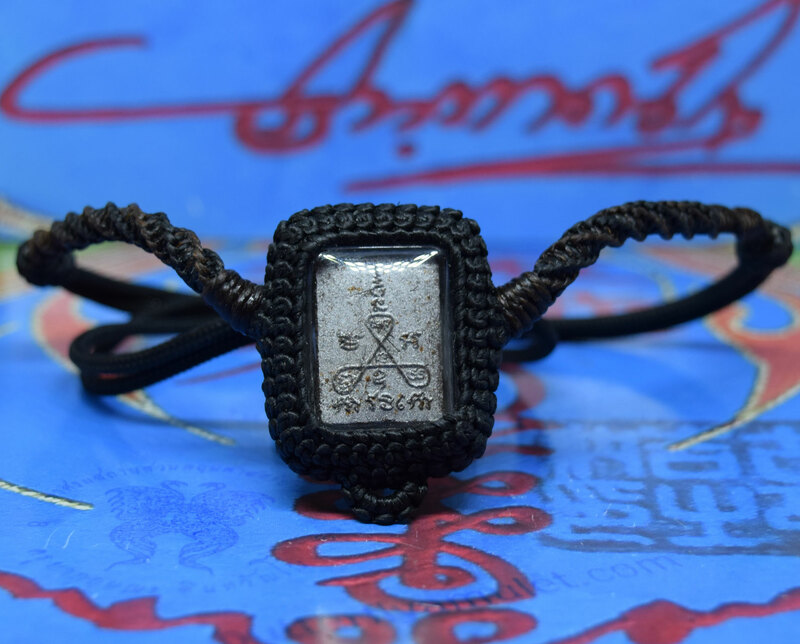 The amulet with a single salika in the center, on the reverse side Yant, from Buriram Temple. 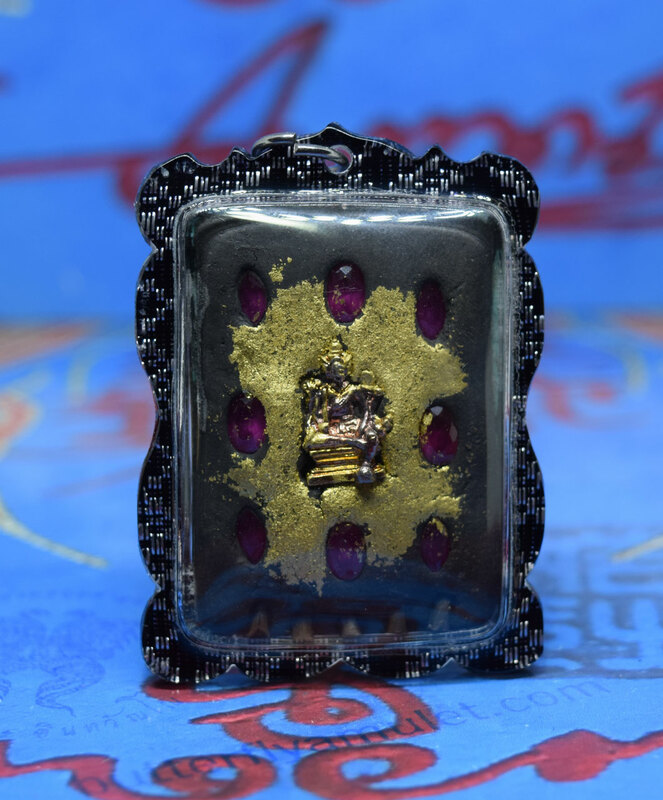 Waterproof casing. 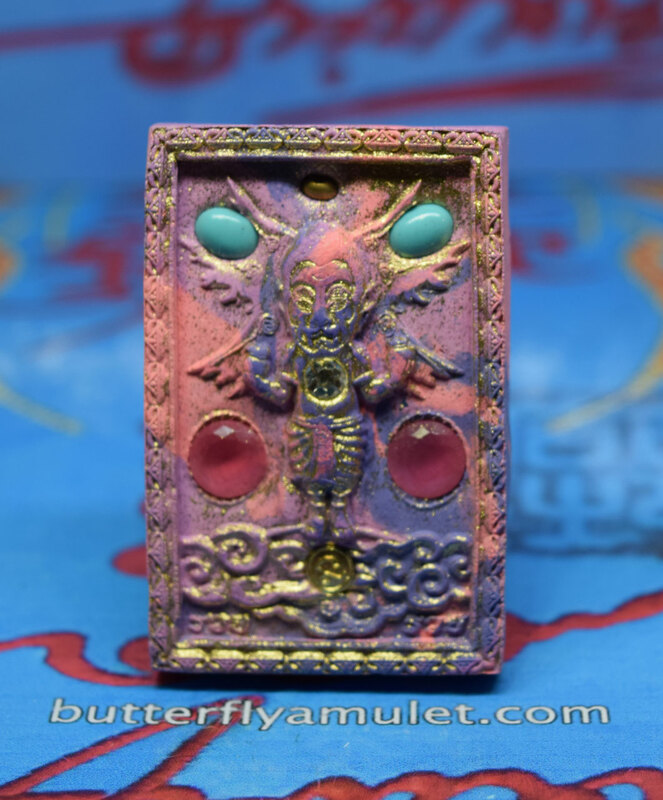 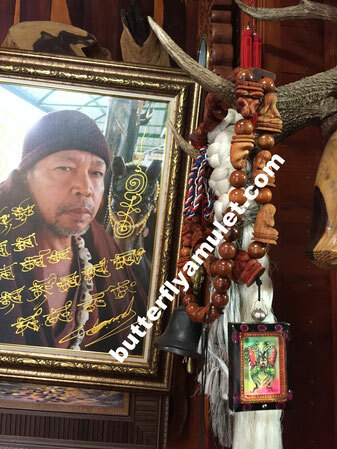 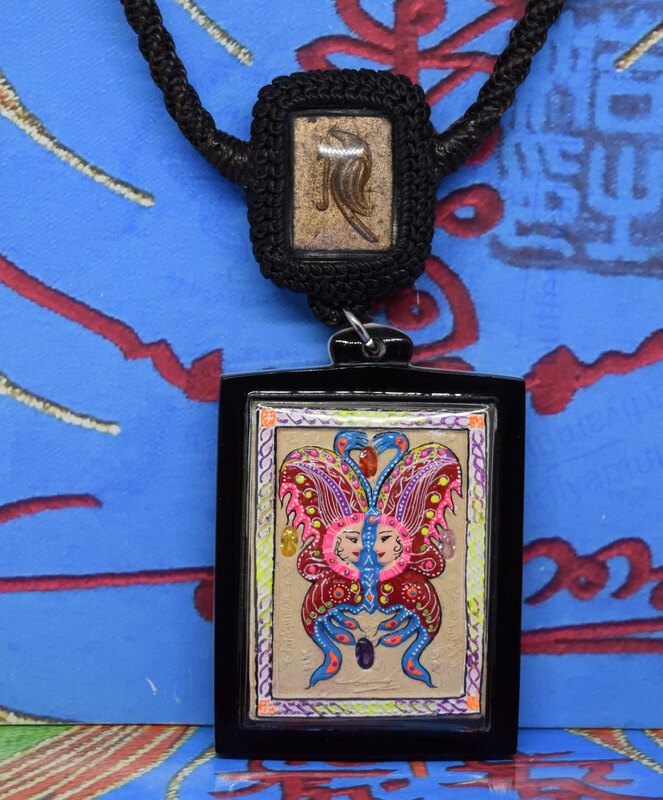 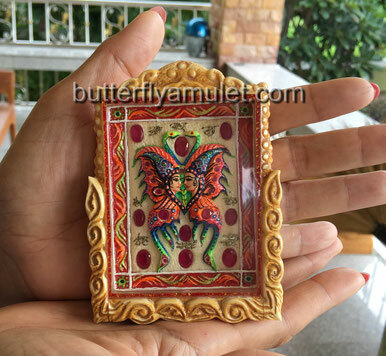 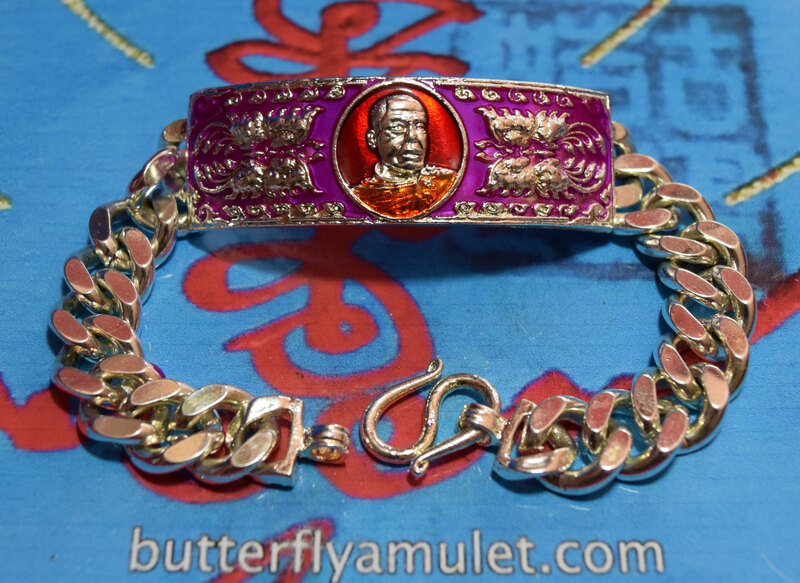 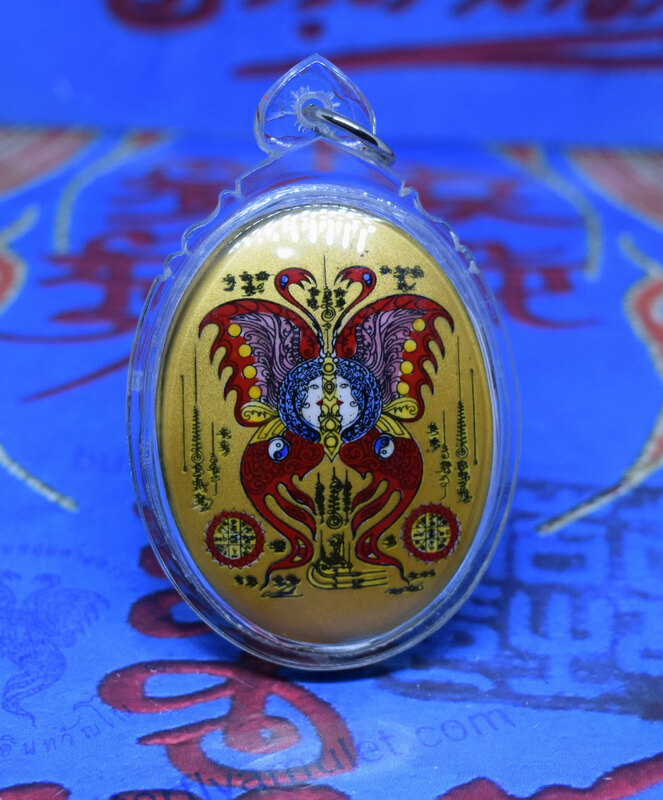 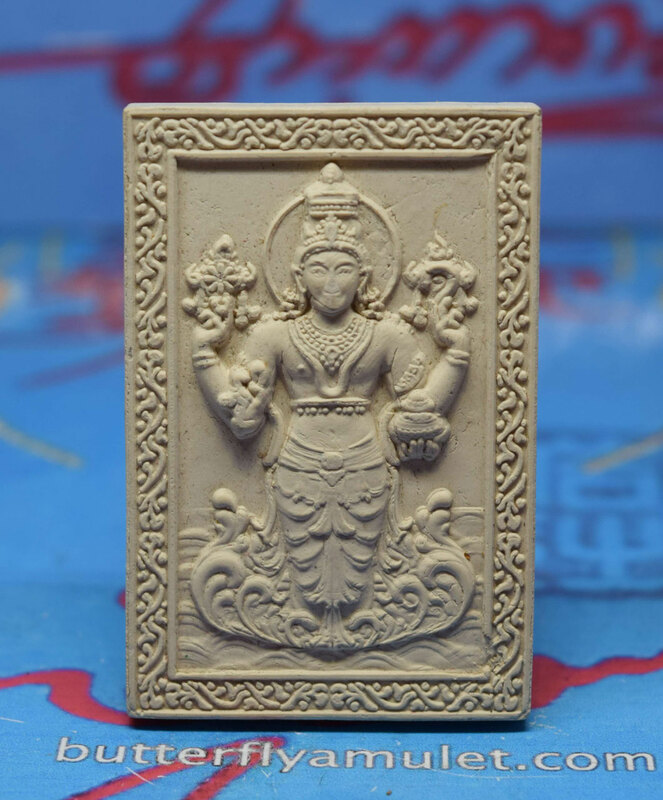 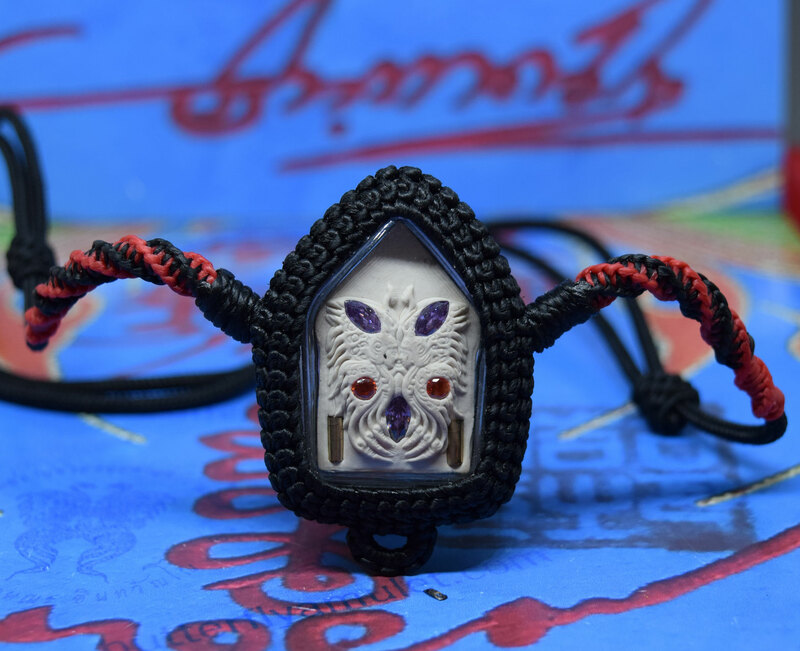 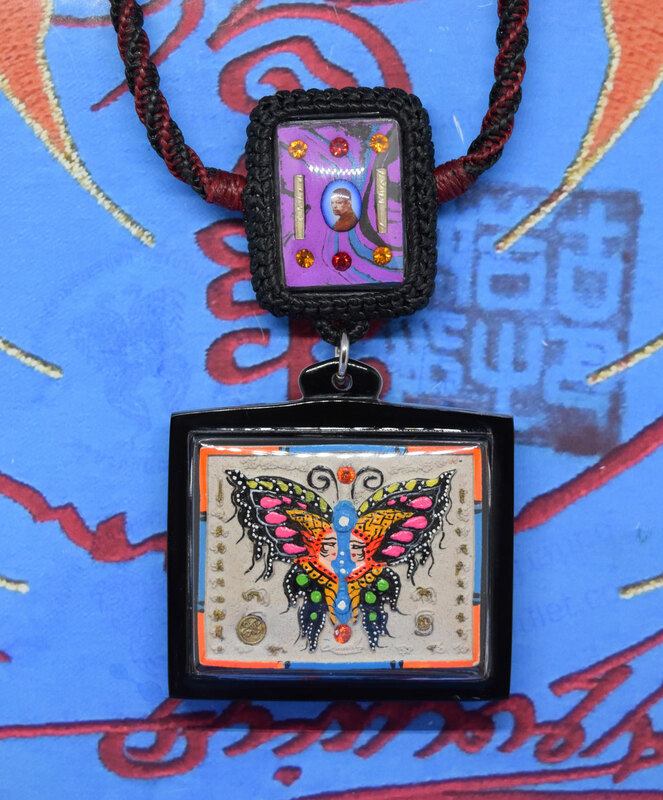 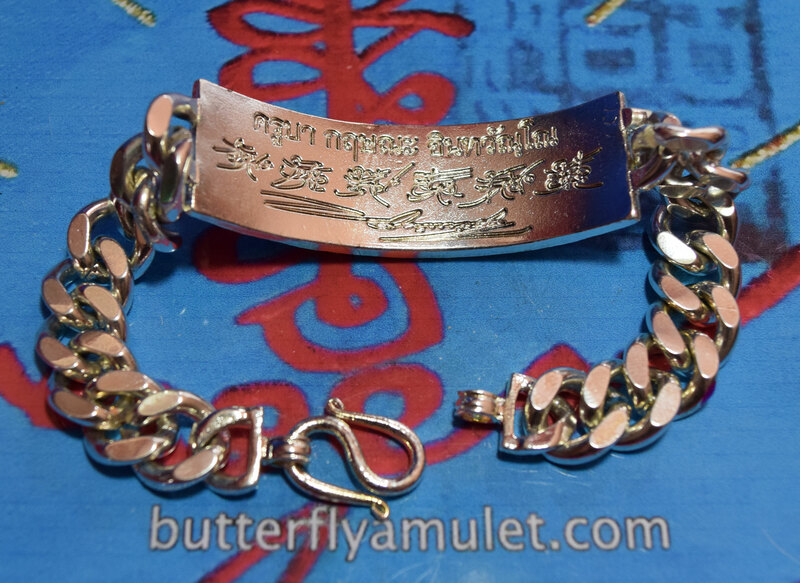 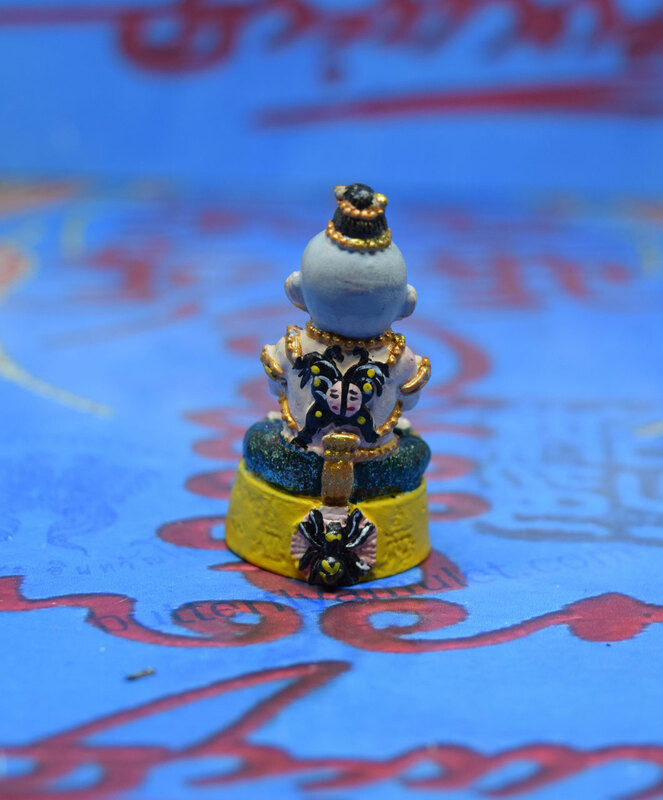 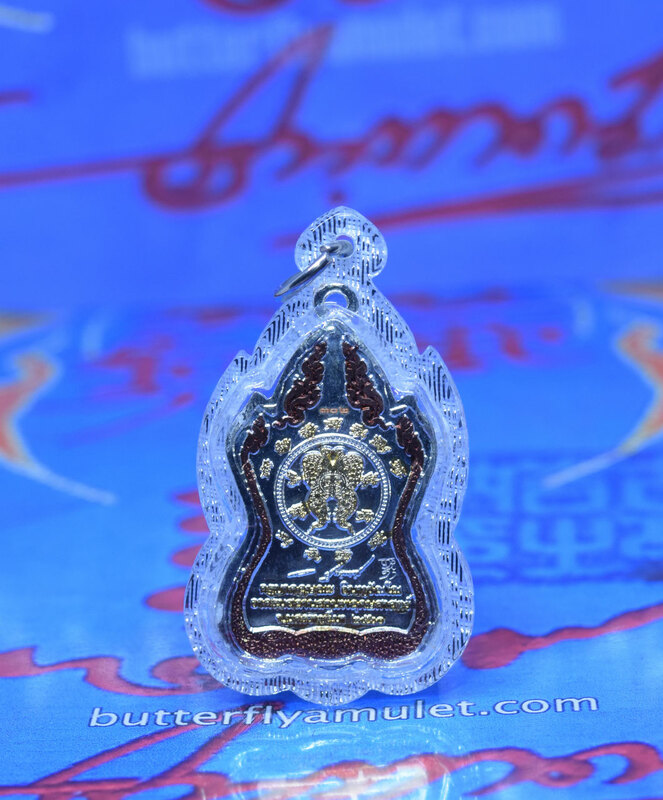 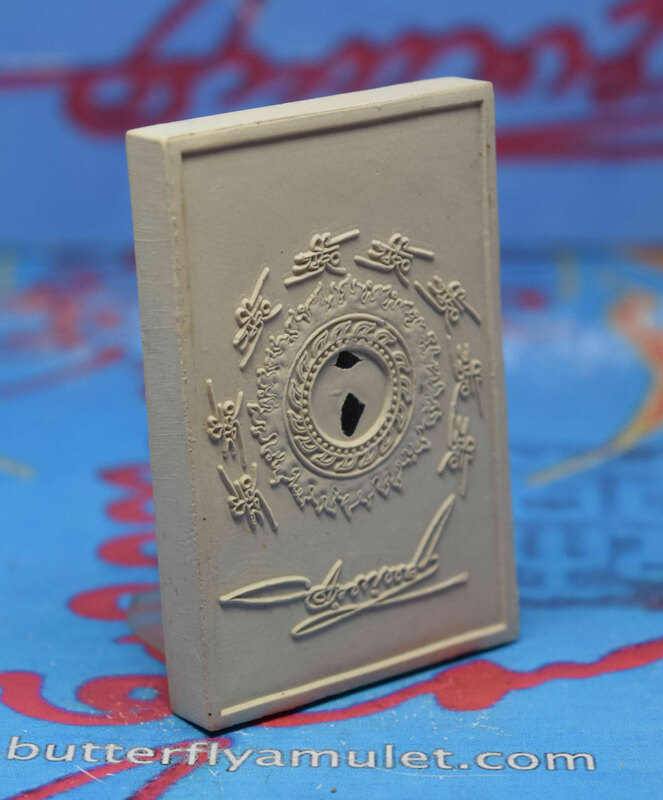 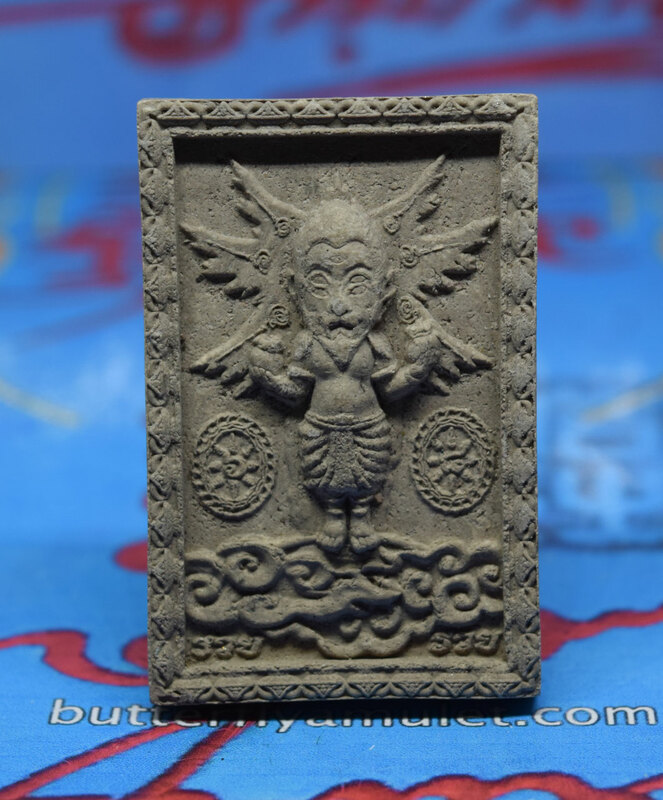 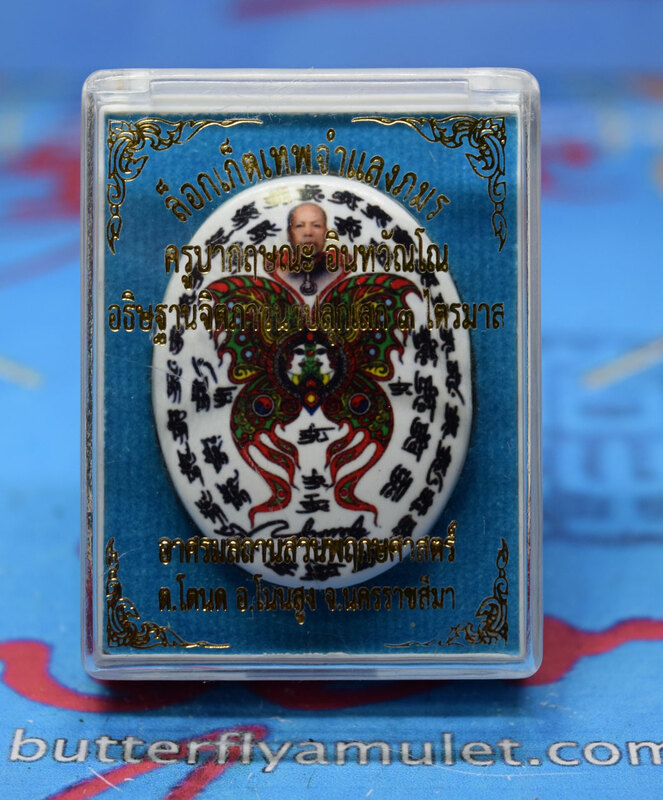 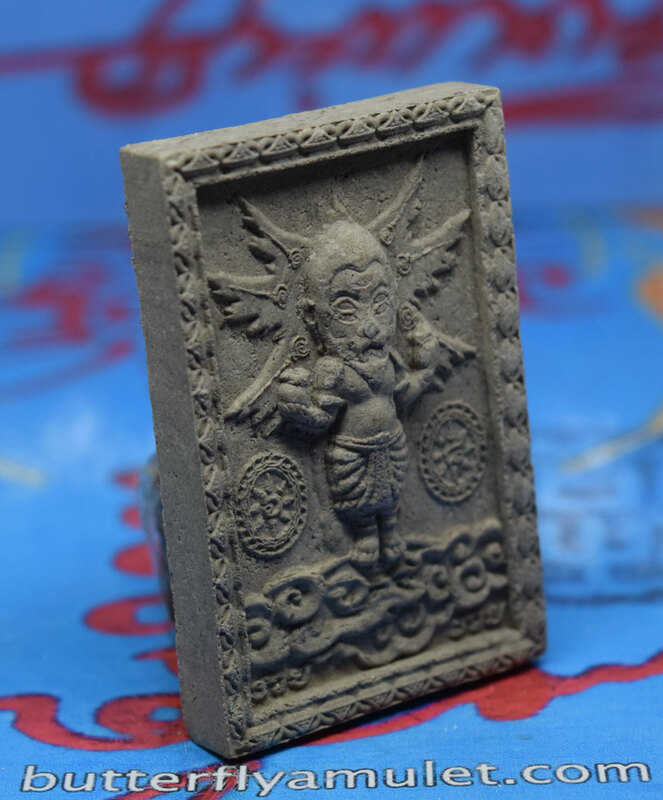 The Butterfly amulet is 50mm x 37mm Block A made from white powder in BE2557, on the reverse a takrat and signed by Kruba in a waterproof casing . 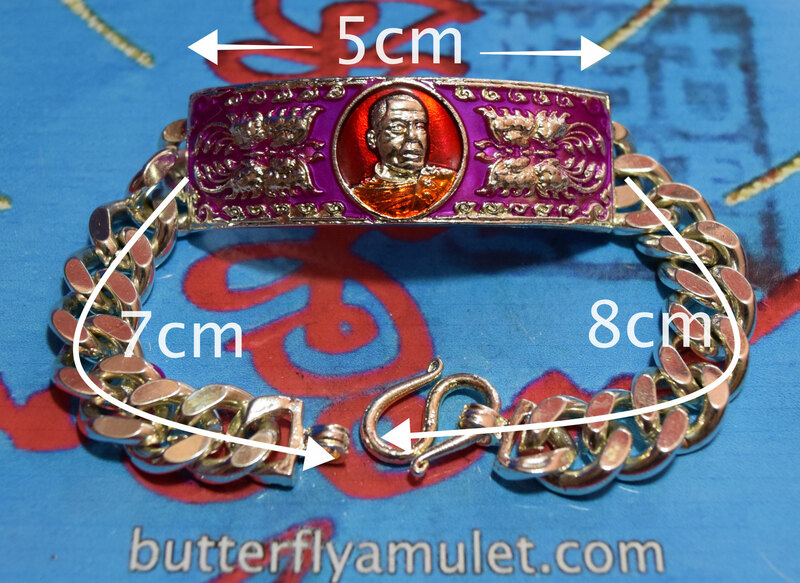 The necklace is approximately 64mm long.